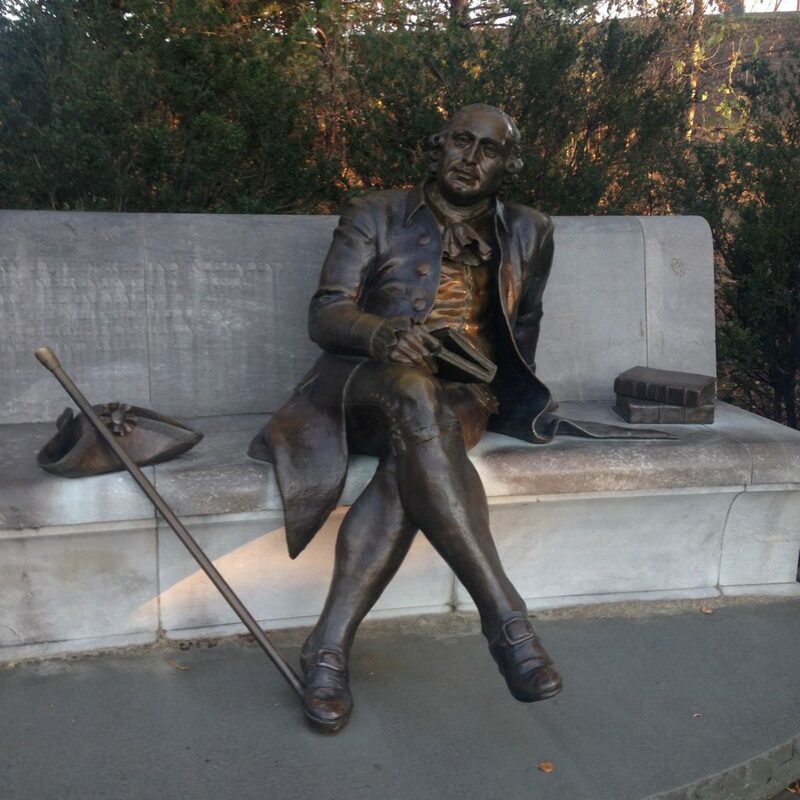 My friend Chris Berard sends me a photo he took on a recent trip to New York City. 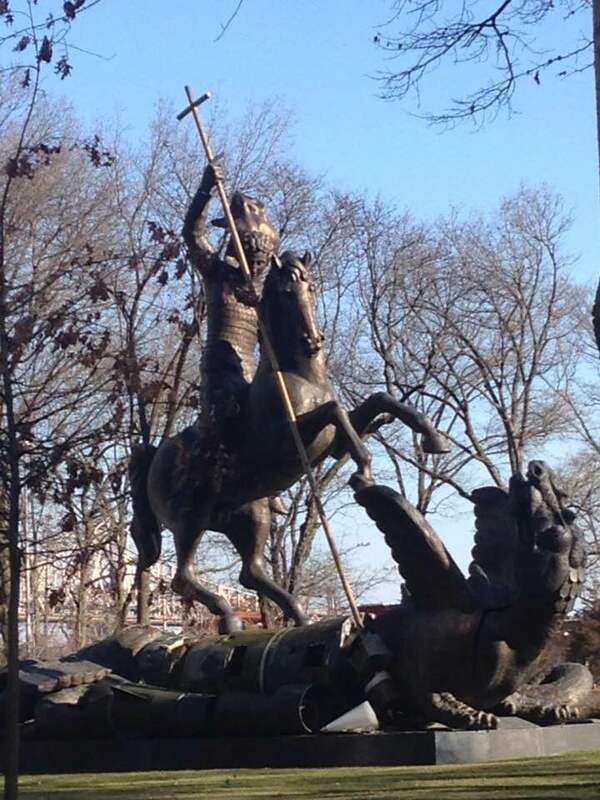 This St. George statue is relatively famous: Zurab Tsereteli’s Good Defeats Evil (1990), located north of the entrance to the United Nations’ General Assembly Building. 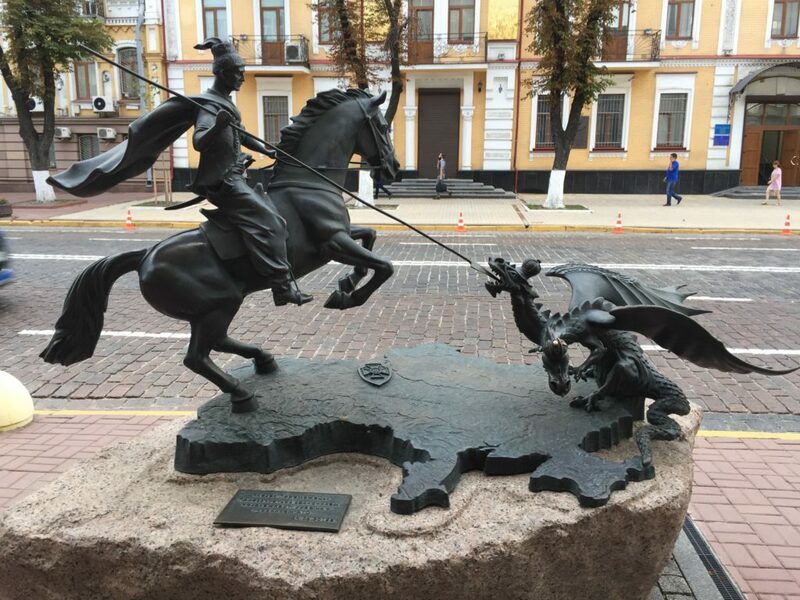 Given the Georgian nationality of the artist and the date of the installation, it would be tempting to see this statue as symbolic of the defeat of Communism, but the “evil” represented here is the Cold War itself – the dragon’s body is made up of pieces of US Pershing and Soviet SS-20 nuclear missiles. 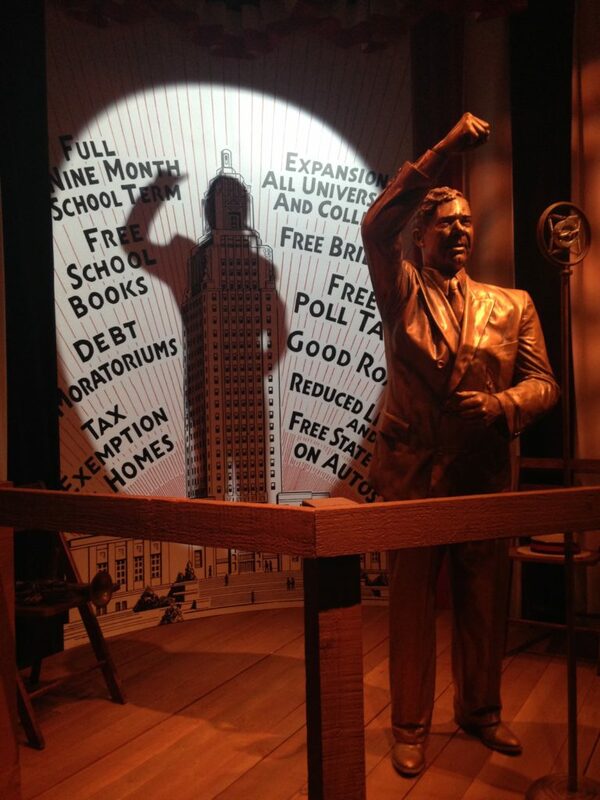 It occurs to me that I’ve seen this image before, at the George W. Bush Library and Museum in Dallas. There, it is rendered on a copper shield with cloisonné enamel artwork, by the same artist. 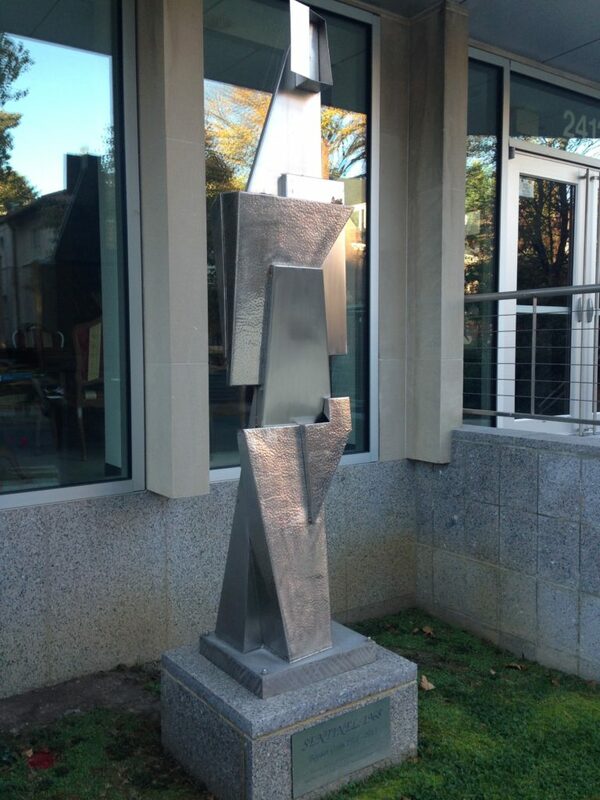 Georgian President Eduard Shevardnadze presented this piece to Pres. Bush, presumably before 2003, when Shevardnadze was ousted from office as a result of the Rose Revolution. 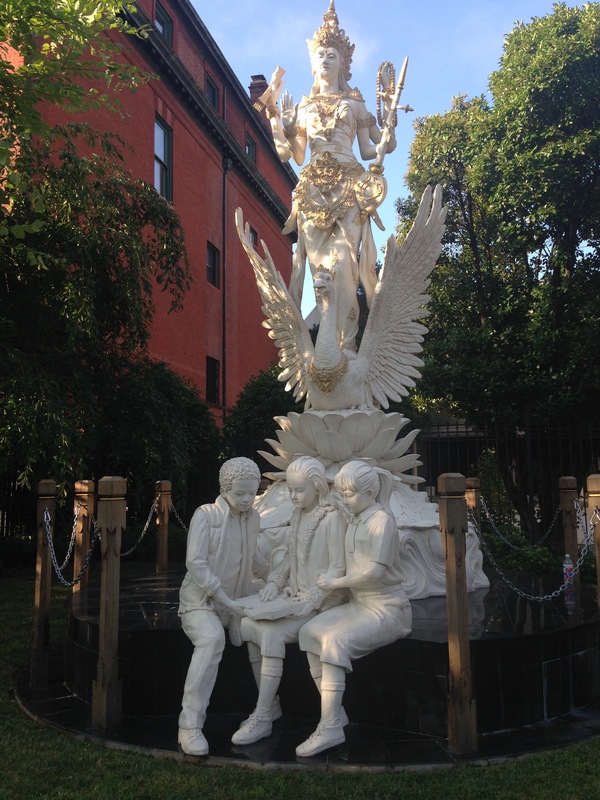 From a Ukrainian family friend: a monument in Kiev, in memory of the first casualties of the Russian invasion in 2015. Note how the dragon has two heads, each wearing an imperial crown, like the eagle on the Russian coat of arms. 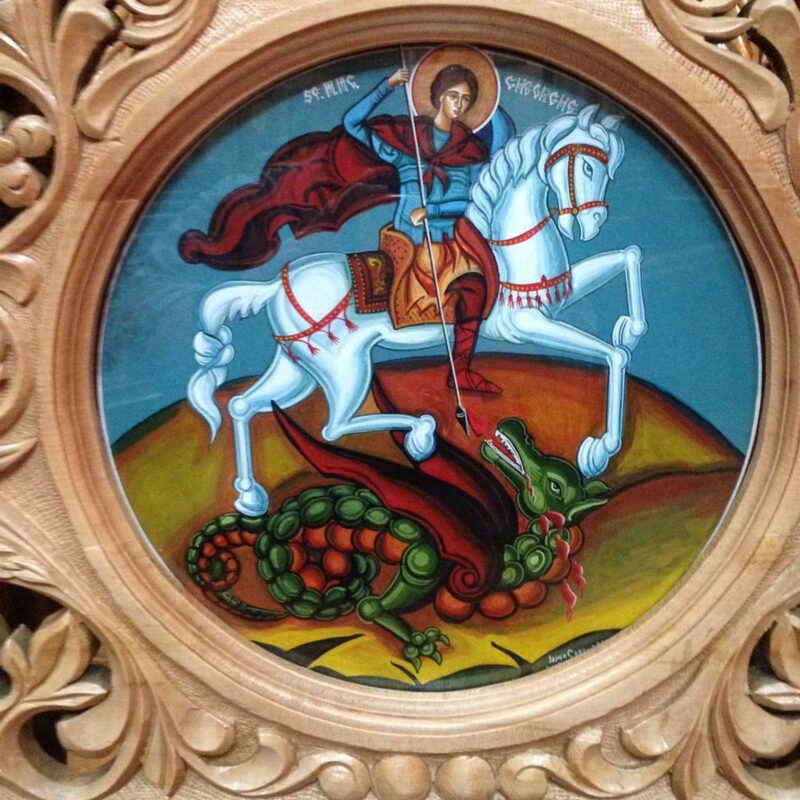 St. George, according to our friend, is dressed as a real Ukrainian. 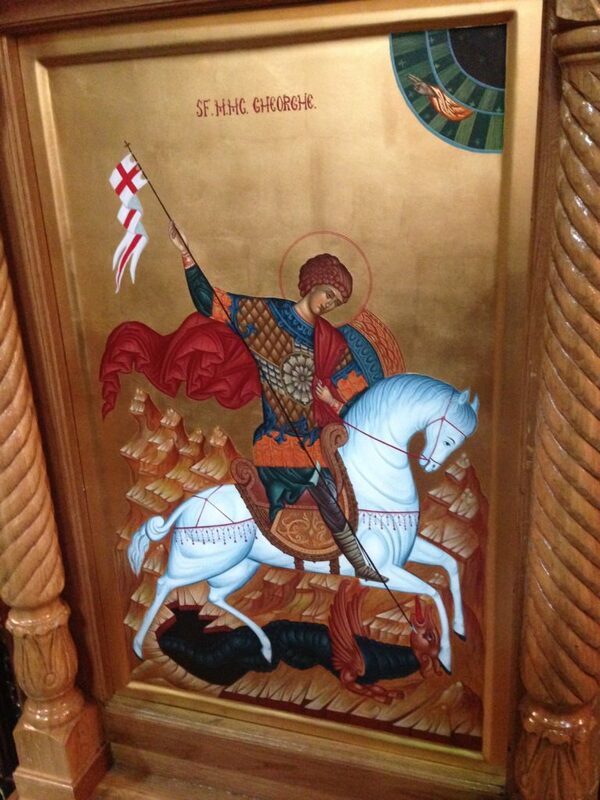 I cannot pass an image of my patron saint George without snapping a photo. A two week trip to Ireland and London, from which I have just returned, netted me a bunch. Lucky reader, I share them with you! At Bunratty Castle, Co. Clare, Republic of Ireland. Bunratty was built in the fifteenth century for the MacNamara family, who were local grandees. 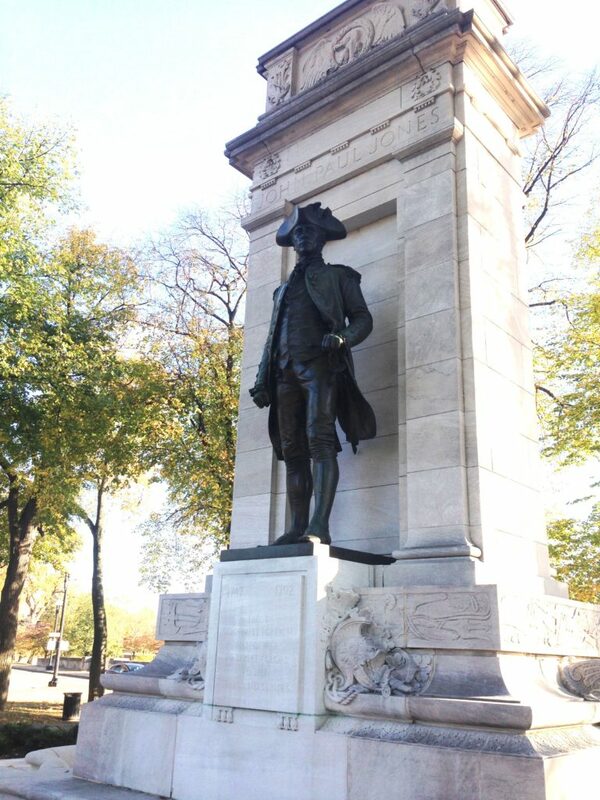 By the early twentieth century it was in disrepair; in 1956 it was purchased and restored by Viscount Gort with the help of Ireland’s Office of Public Works. Its proximity to Shannon Airport has made it one of Ireland’s tourist success stories, and a number of humbler historic buildings have been moved there, producing a Colonial Williamsburg-style “folk park.” None of the furnishings is original, so I can’t link this carving to any particular owner of the castle. 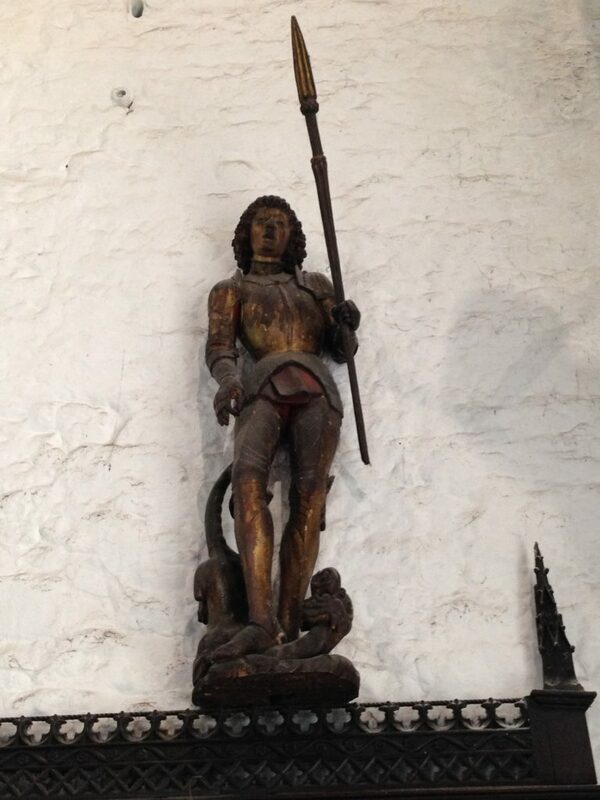 But it makes sense that the warrior saint George should be there. My loving wife snapped this one for me. It is etched into a window of the modernist Coventry Cathedral in England (the church is actually dedicated to St. Michael). 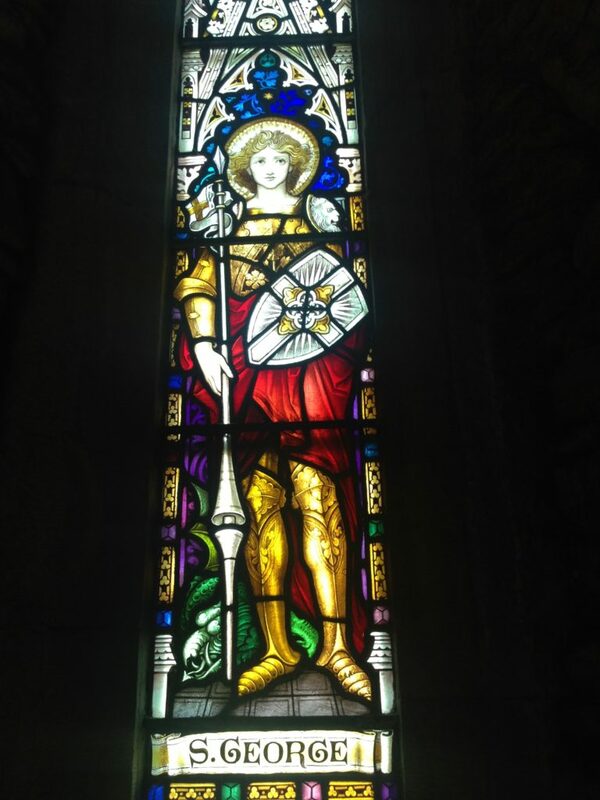 In St. Mary’s Roman Catholic Church, Dingle, Co. Kerry. 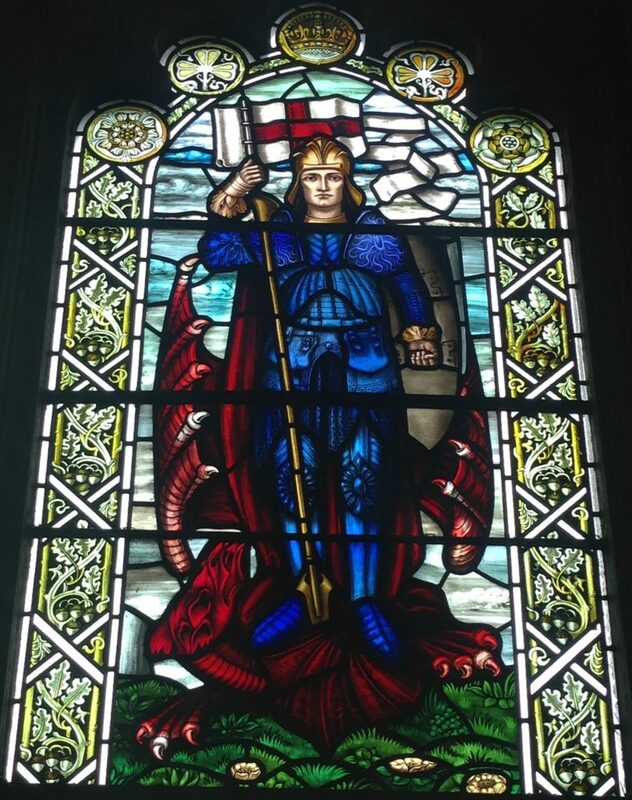 Note that neither his shield nor his banner portrays a red cross, the symbol of England. But this one does! I found this in the baptistry of Christ Church Cathedral in Dublin. Christ Church is the seat of the Archbishop of Dublin and Glendalough in the Church of Ireland, i.e. 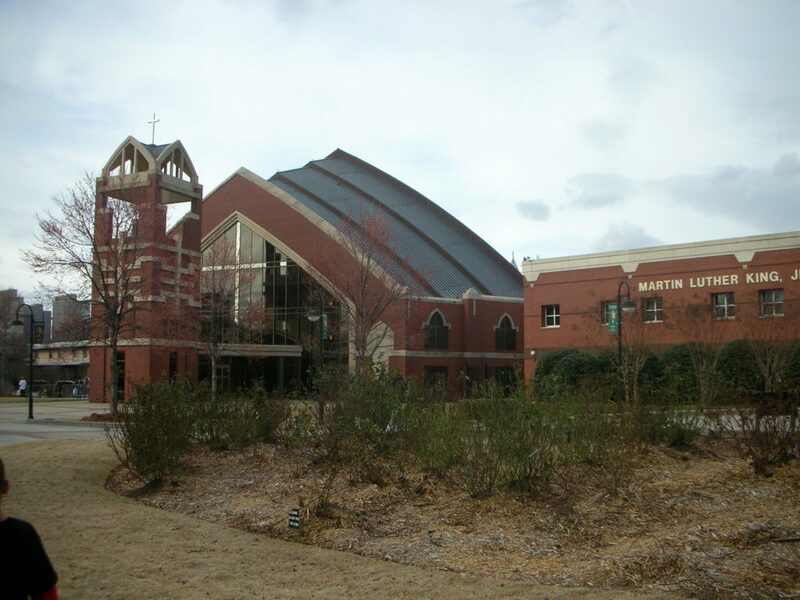 the “Protestant” church in communion with the Church of England. 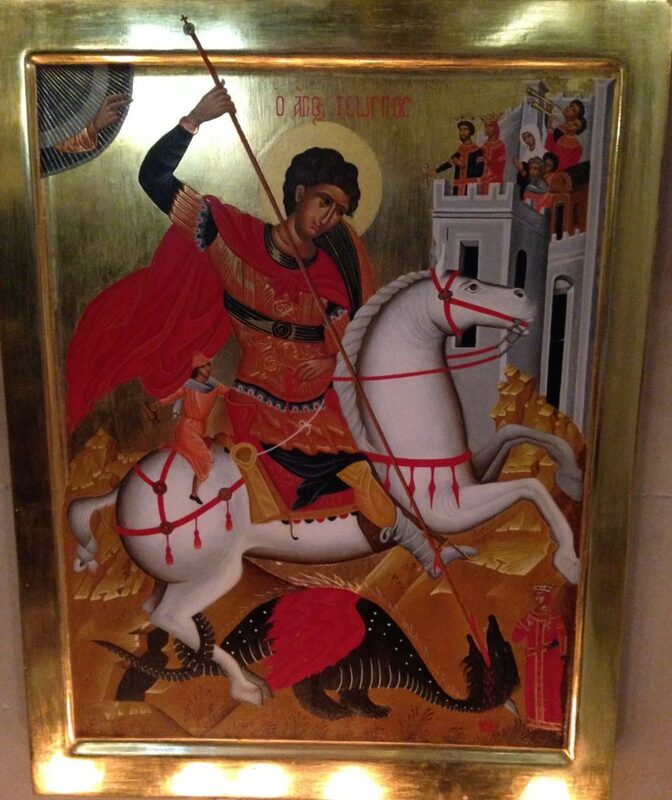 Also from Christ Church: “St George the dragon-slayer, from a mid-16th century prototype in the Historical Museum of Moscow, Russia.” I was pleased to see the pitcher-bearing boy here. 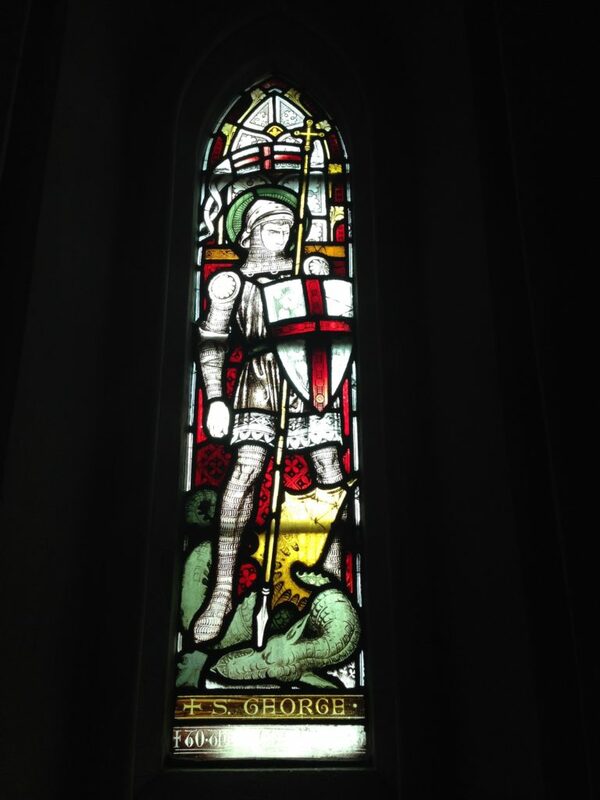 Another St. George in stained glass. 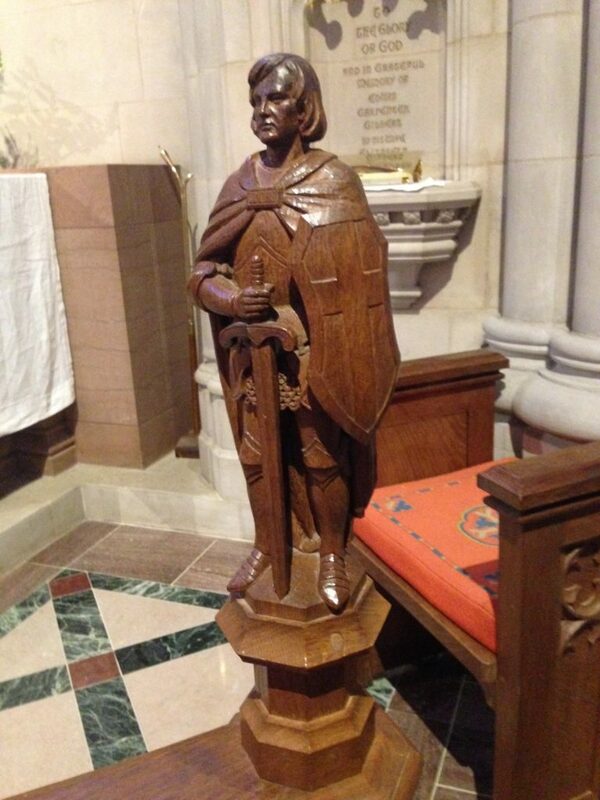 This one may be see in the Guildhall in Londonderry, Northern Ireland. 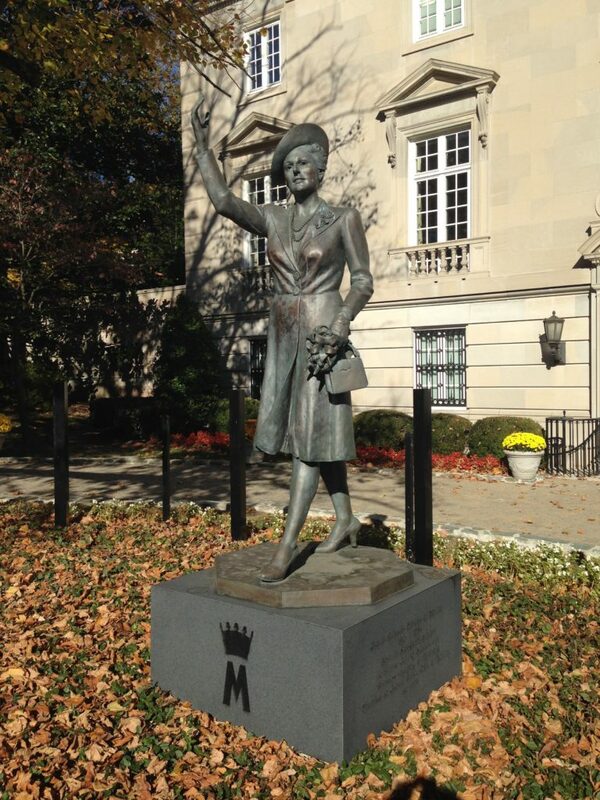 The crown, shamrocks, and roses at the top indicate this is a strong statement of unionism. 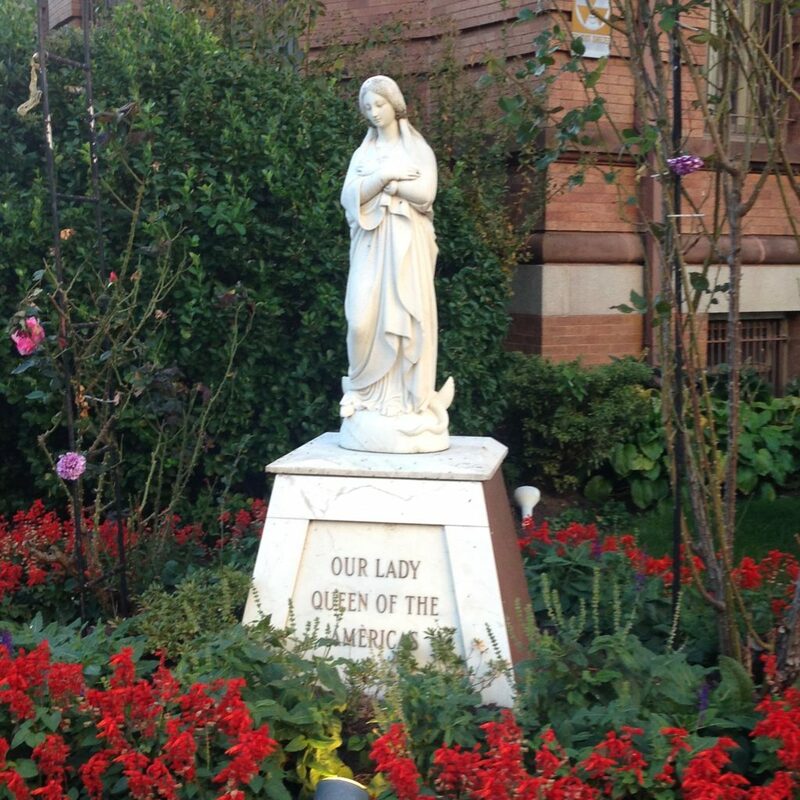 The oak leaves are a symbol of Londonderry – “Doire” is “oak grove” in Irish. St. Dunstan-in-the-West is a church on Fleet Street, one of many in the City of London, where I found the icon above. Note the script, standing for “Sfântul Mare Mucenic Gheorghe” – that’s because the church is one of three in England shared with the Romanian Orthodox community. Another very handsome Romanian icon in St. Dunstan-in-the-West. St. George’s Hanover Square (City of Westminster) is a fine eighteenth-century neoclassical structure, and perhaps fittingly did not have any images of its patron saint. 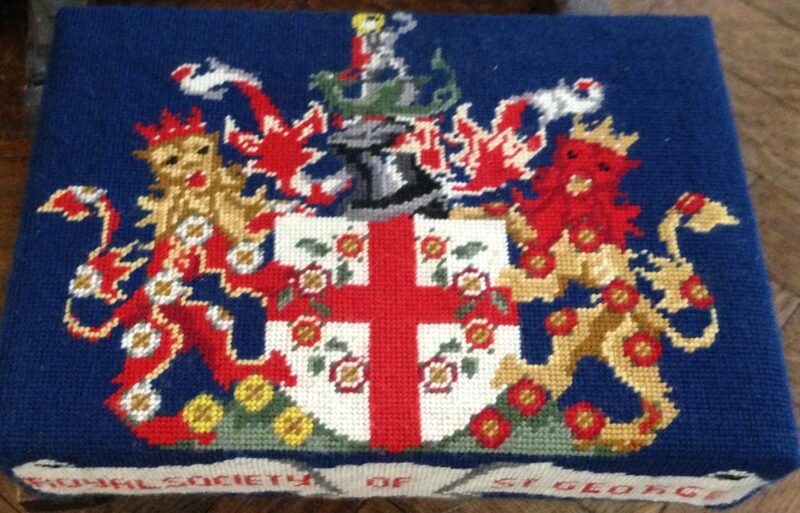 It did, however, have an embroidered kneeler featuring the arms of the Royal Society of St. George. 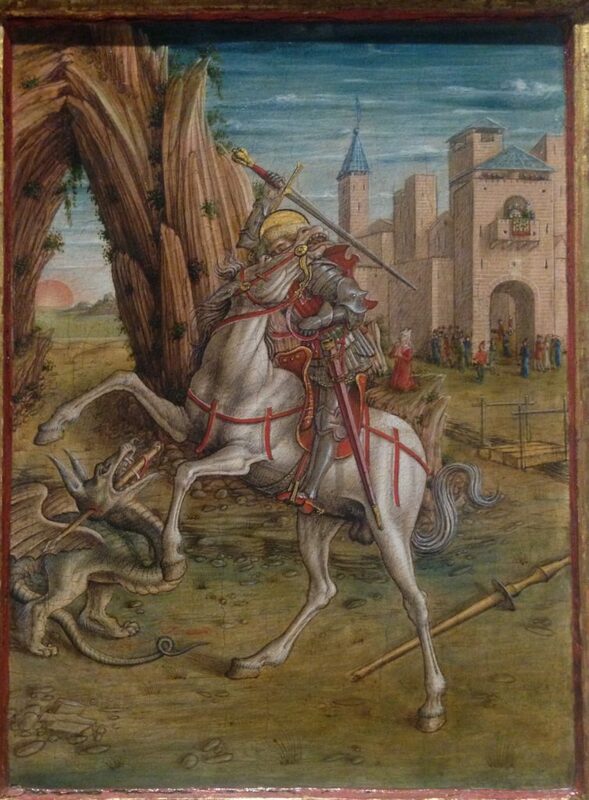 St. George kills a dragon on the crest. 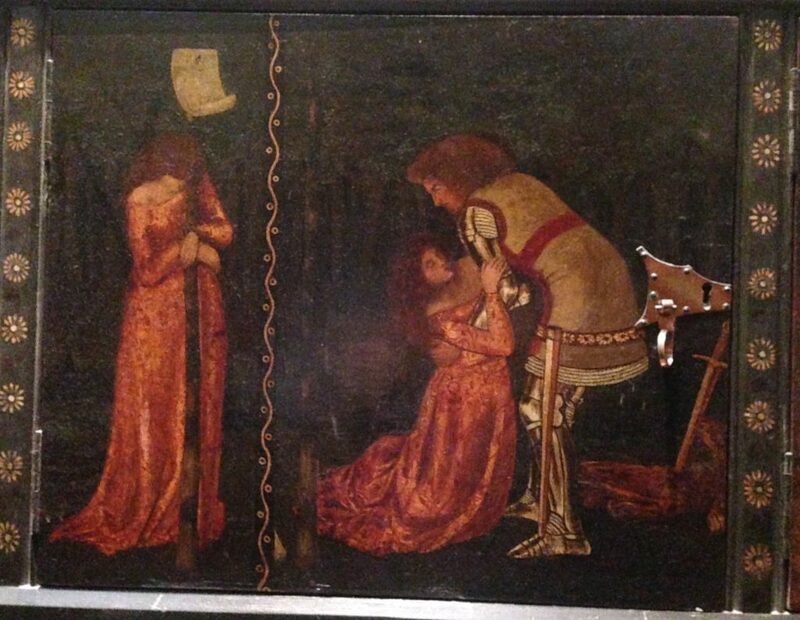 I foolishly did not record the artist of this painting in the National Gallery. 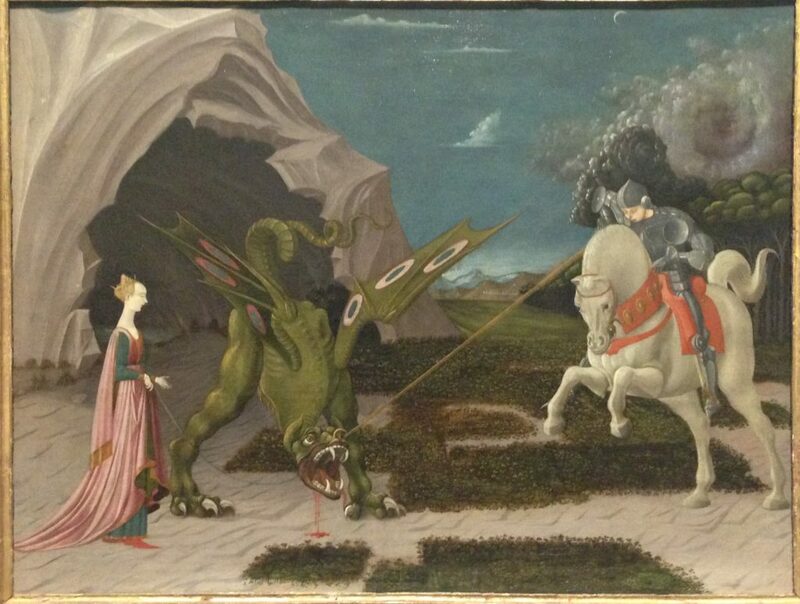 But this one, also in the National Gallery, is a very famous image of St. George killing the dragon, by Paolo Ucello of Florence, c. 1456. Ucello is not as scrupulous with chronology as later Renaissance artists were. 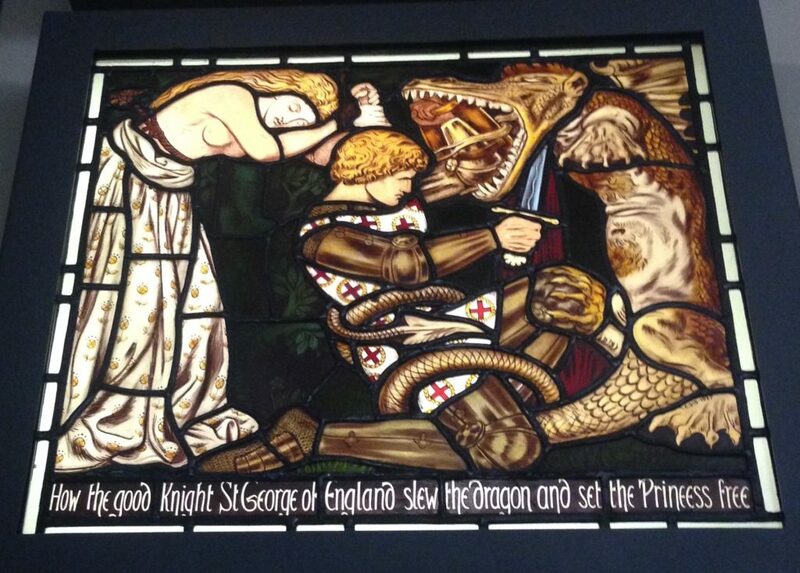 In the legend, St. George wounds the dragon, and then instructs the maiden to tie her girdle around its neck. 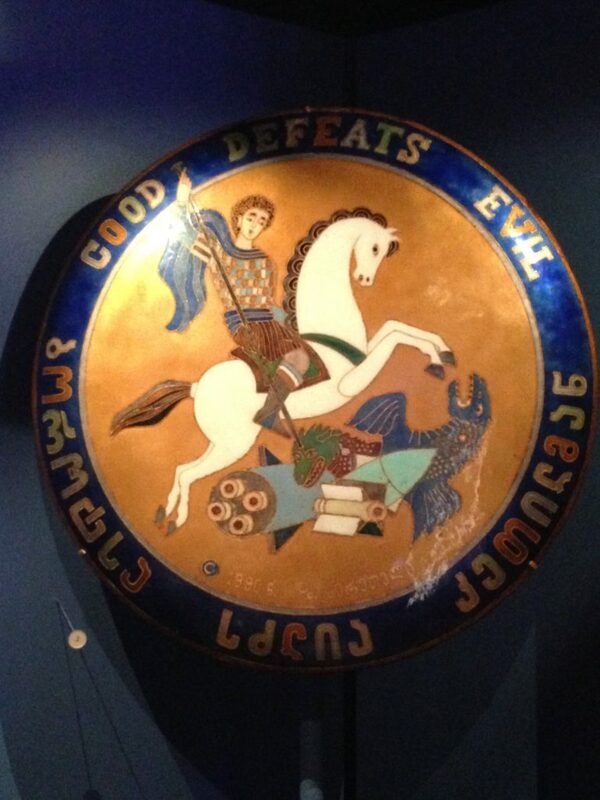 By depicting these two things happening at once, the painting prompts the question: “Why is that bad man hurting the nice lady’s pet dragon?” I’ve always been puzzled by the strange cloud formation behind St. George, but I love the RAF roundels on the dragon’s wings. 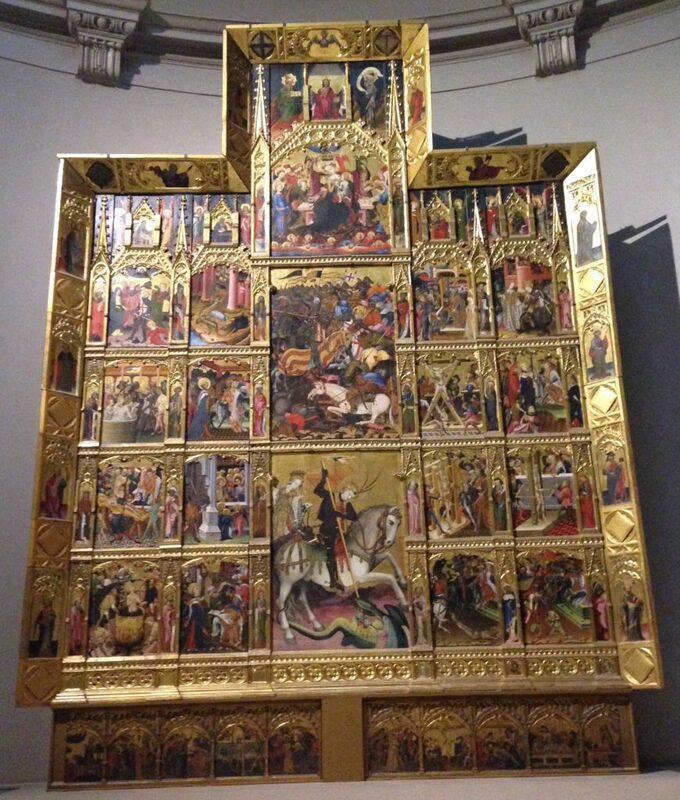 This tableau goes by the name of the Valencia Altarpiece, and you can see it on display at the Victoria and Albert Museum in Kensington. 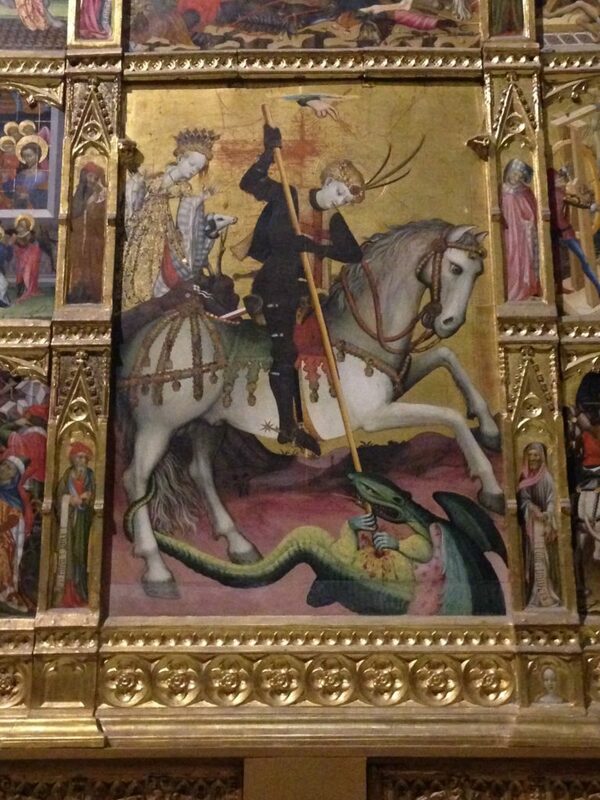 It was produced in Valencia, Spain around 1410, and depicts, in addition to the usual image of St. George killing the dragon (below), numerous tortures endured by the saint during his martyrdom. 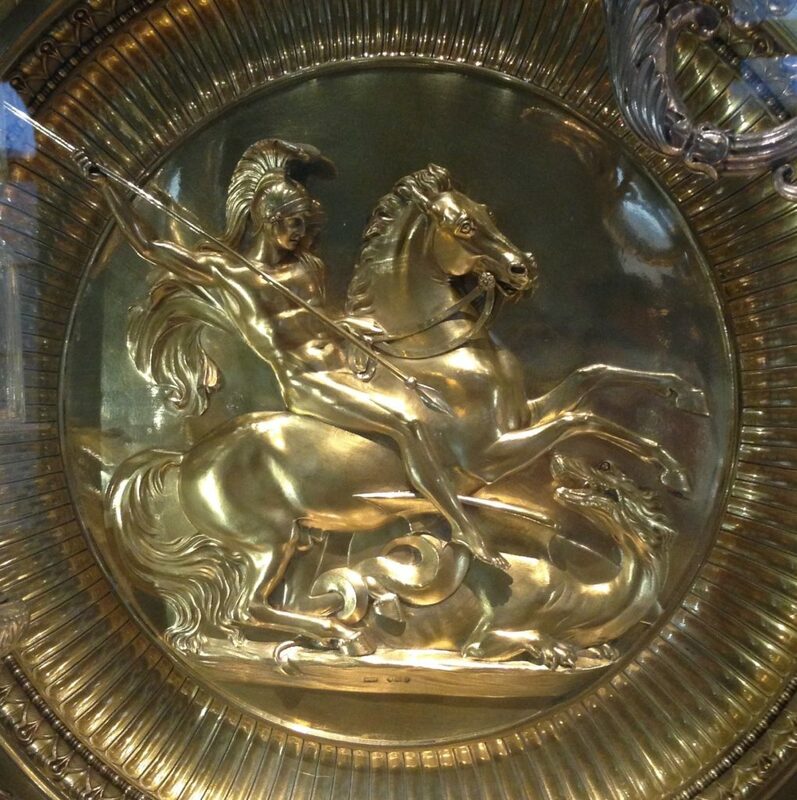 This is Benedetto Pistrucci’s rendition of St. George and the dragon, which was produced in 1817 and appeared on gold sovereigns throughout the nineteenth century. 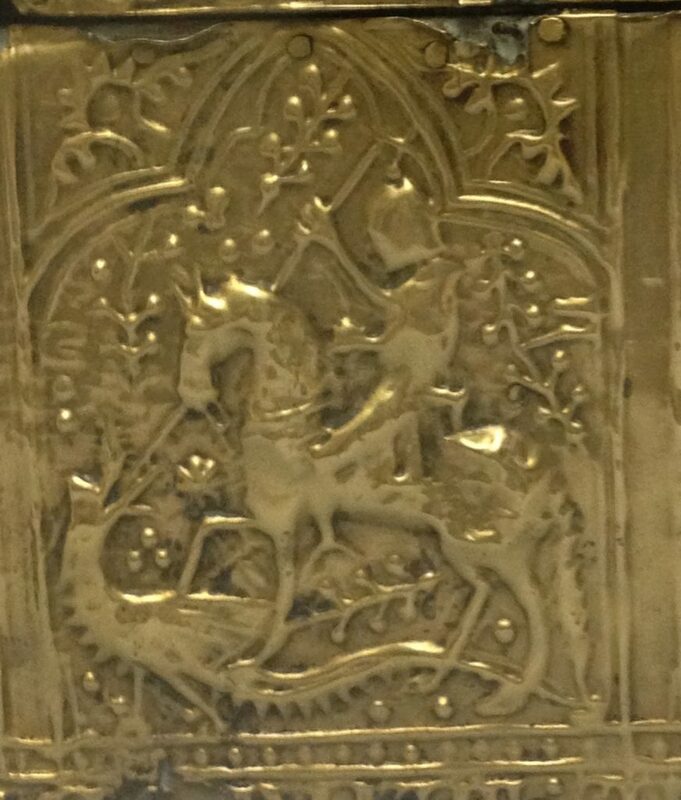 That George is buck naked and has his foot waving in front of the dragon’s mouth has been puzzling to some people, but this was a very popular image and was reproduced elsewhere, in this case on a large gold plate. 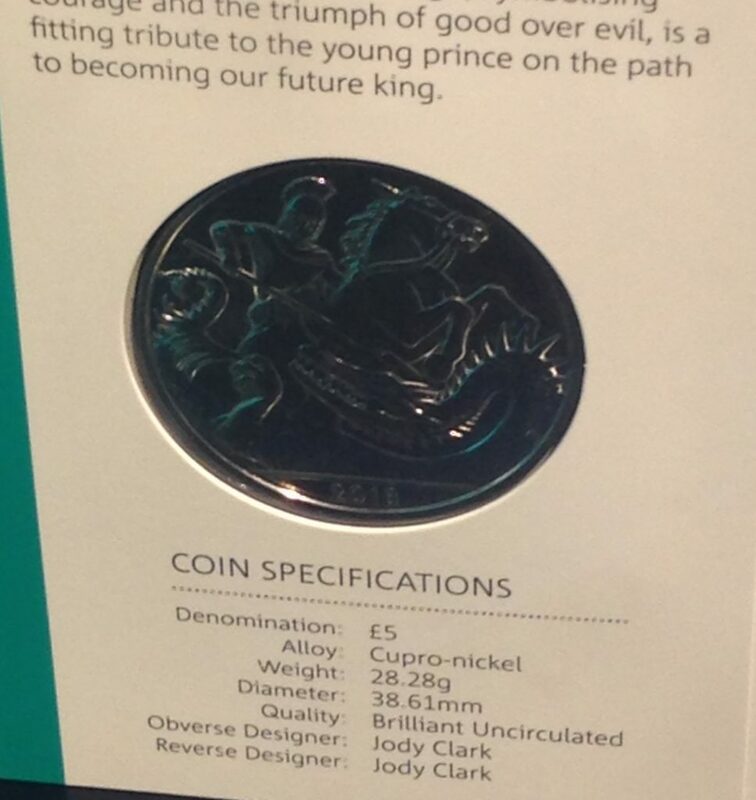 For sale at the Tower of London: a £5 coin commemorating the fifth birthday of Prince George, featuring St. George, naturally. 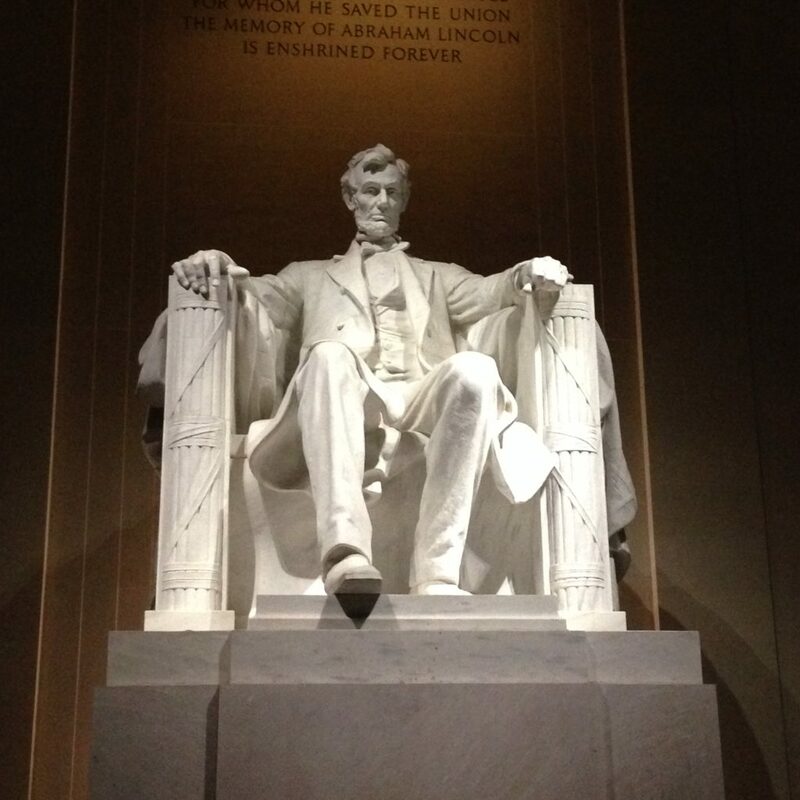 • Abraham Lincoln at the Lincoln Memorial, with throne made of fasces. 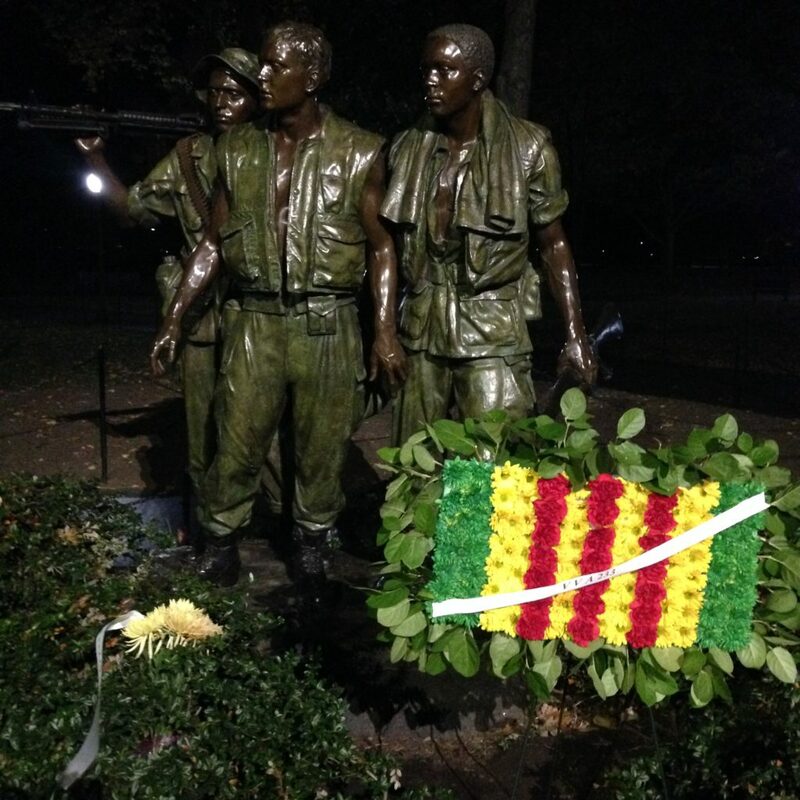 • The Three Soldiers, a controversial addition to Maya Lin’s Vietnam Veterans Memorial. A lot of people found Lin’s black wall of remembrance too bleak, and insisted on something more representational and heroic. 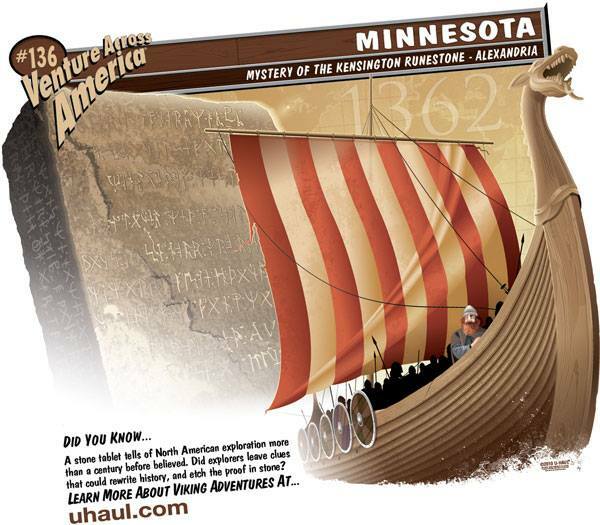 Thus was Frederick Hart commissioned to design the tableau below. 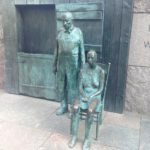 Tom Wolfe had some interesting words to say about it in “The Artist the Art World Couldn’t See.” It was Veterans’ Day, thus the wreath. 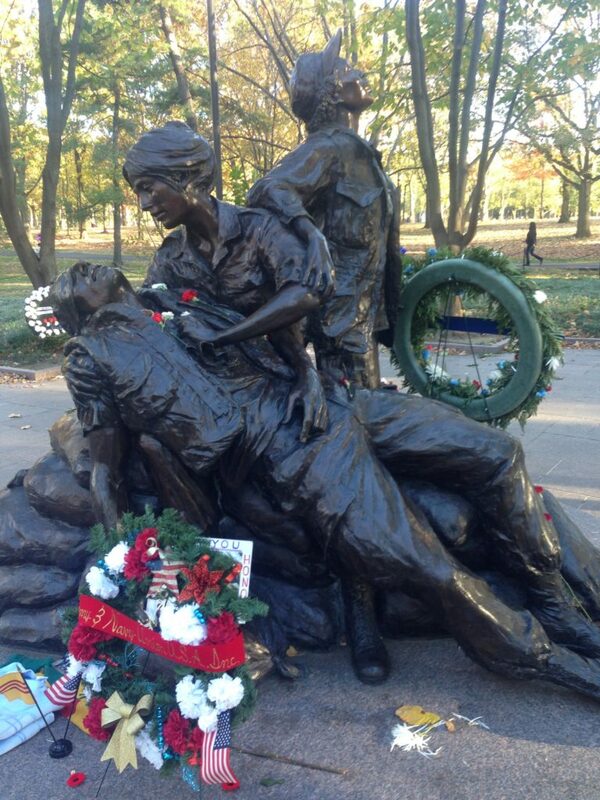 • Nearby, the Vietnam Women’s Memorial by Glenna Goodacre, unveiled in 1993. 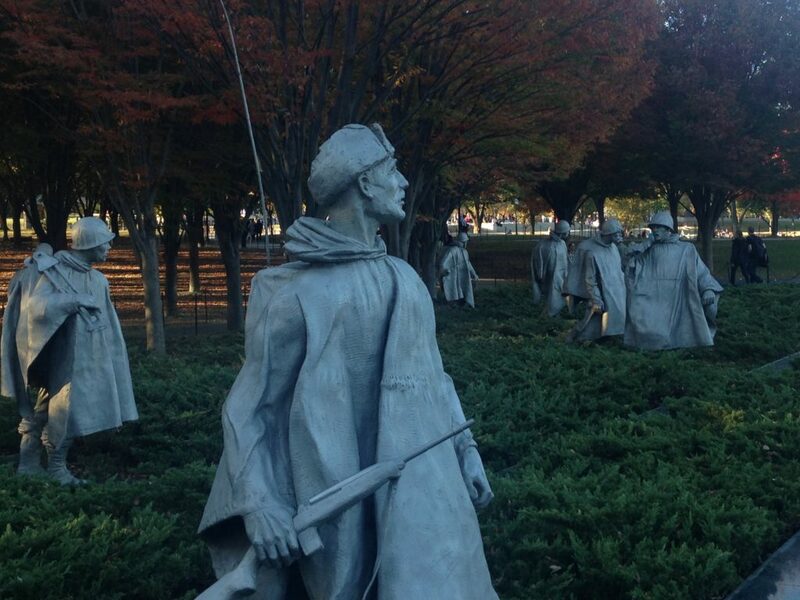 • Across the way, the Korean War Veterans Memorial. 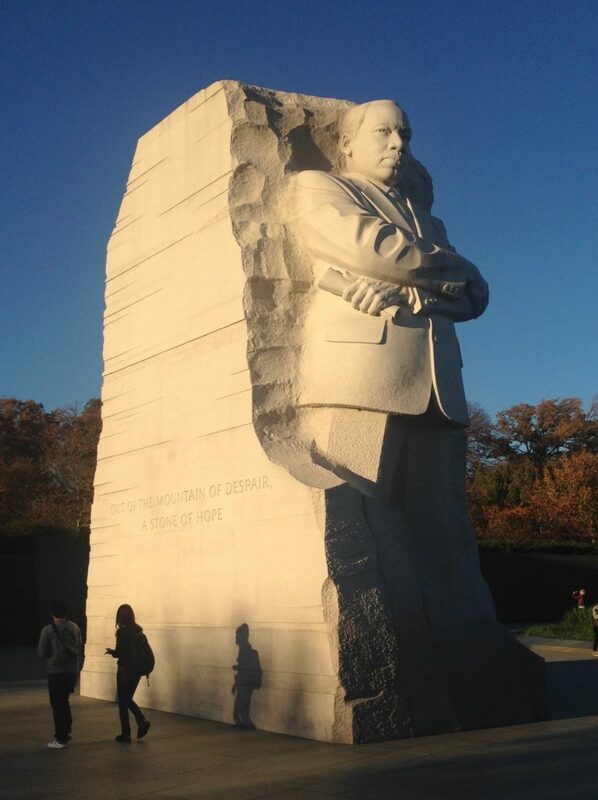 • If you head off the Mall and toward the Tidal Basin, you encounter the Martin Luther King Jr. Memorial, unveiled five years ago. 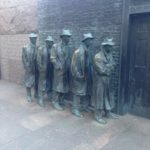 • On the western side of the Tidal Basin, there is the Franklin Delano Roosevelt Memorial, an extensive installation representing FDR’s four terms of office. 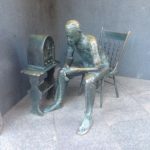 The first one has a number of sculptures representing the Depression. 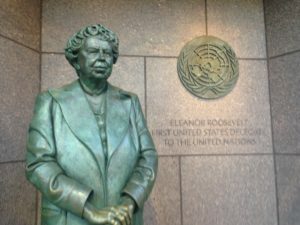 Eleanor Roosevelt appears in the last one. 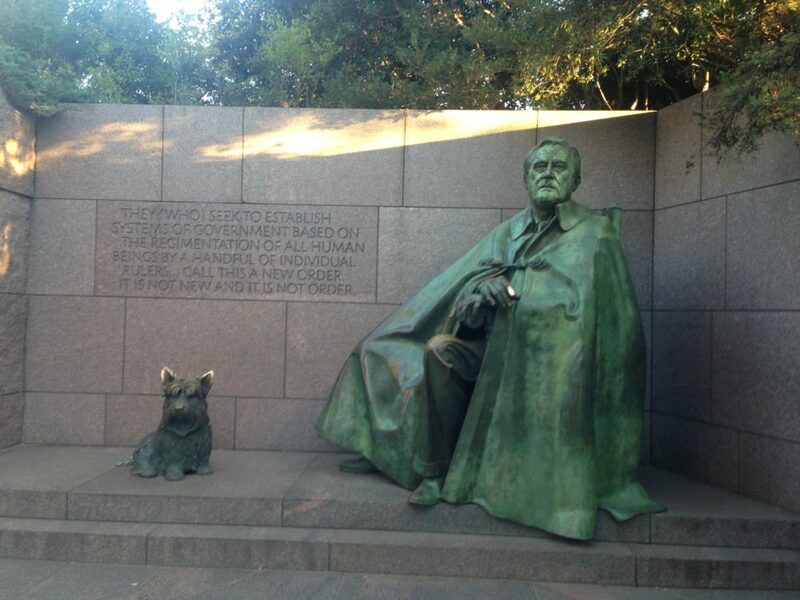 The memorial features two renditions of FDR, a main one with his dog Fala, and another one added later on the insistence of disability rights activists, unambiguously illustrating the president in a wheelchair. 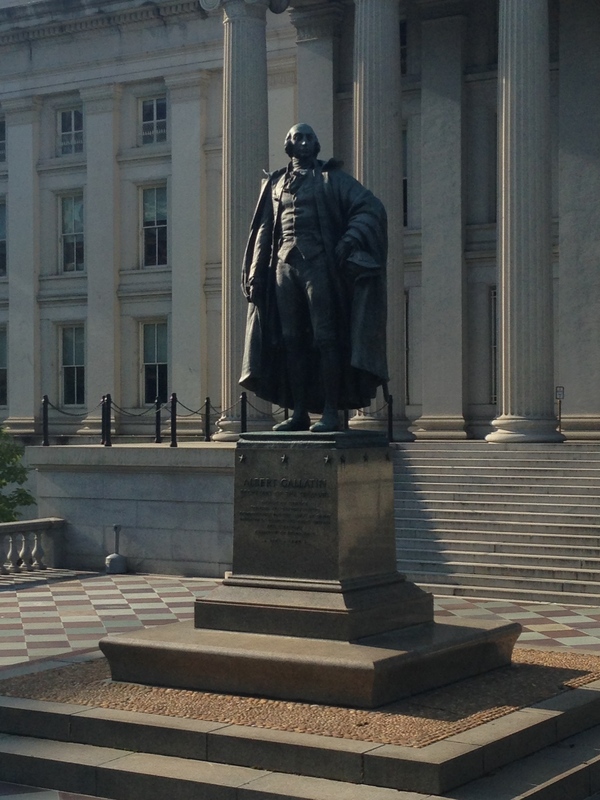 • Continuing around the Tidal Basin, we encounter George Mason, politician and anti-federalist. 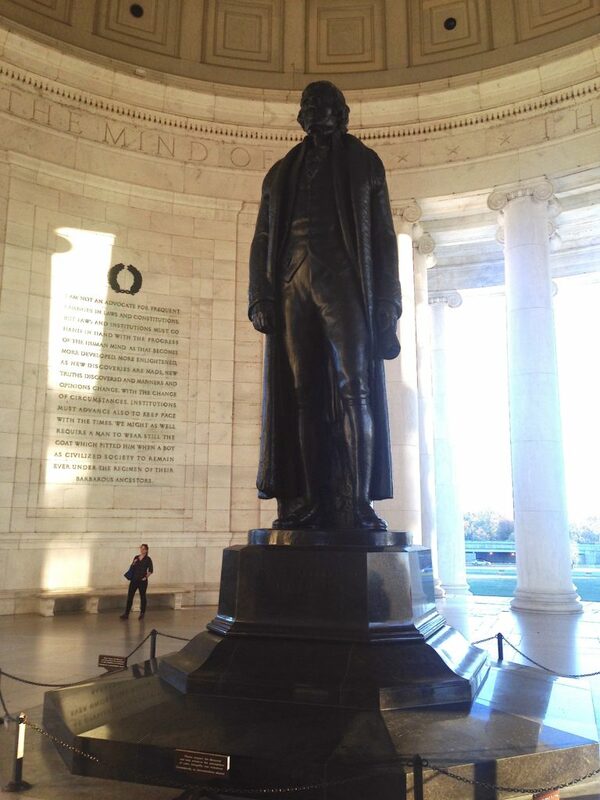 • And at the far end of the Tidal Basin, we have Thomas Jefferson Memorial, a large open neoclassical rotunda featuring a large-than-life statue of the third president. 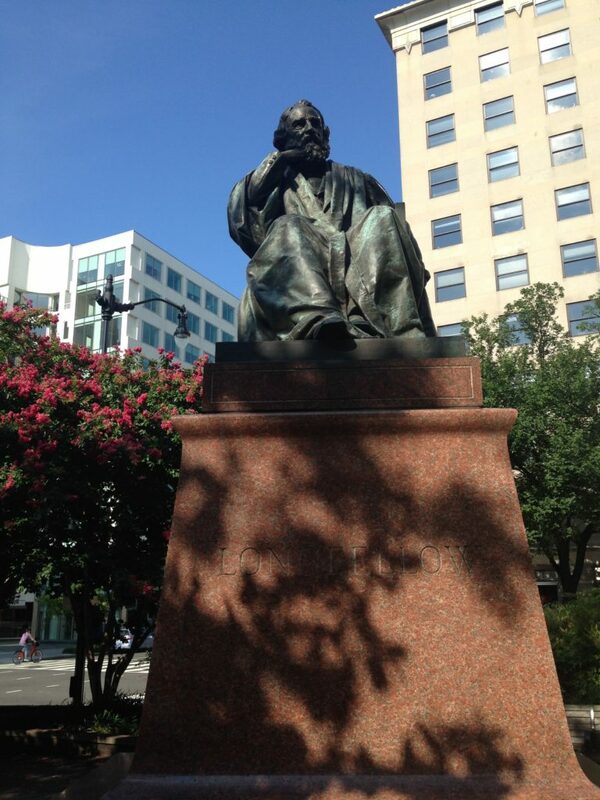 Quotations of his adorn the walls; don’t tell the faculty at UVA. 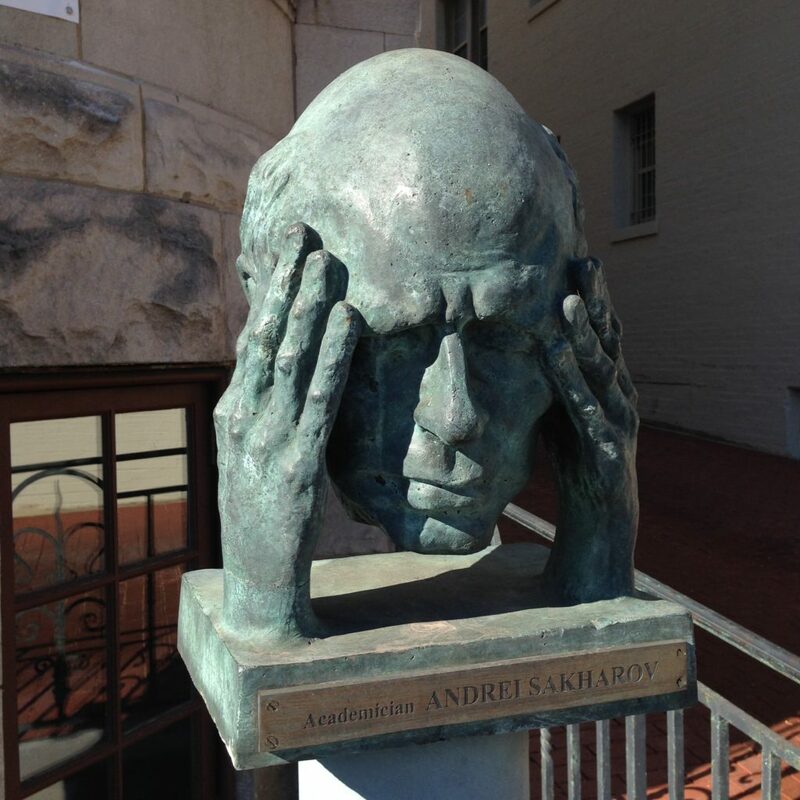 • And an inventive bust of Andrei Sakharov, “academician,” outside Russia House (a restaurant). • Where are my manners? 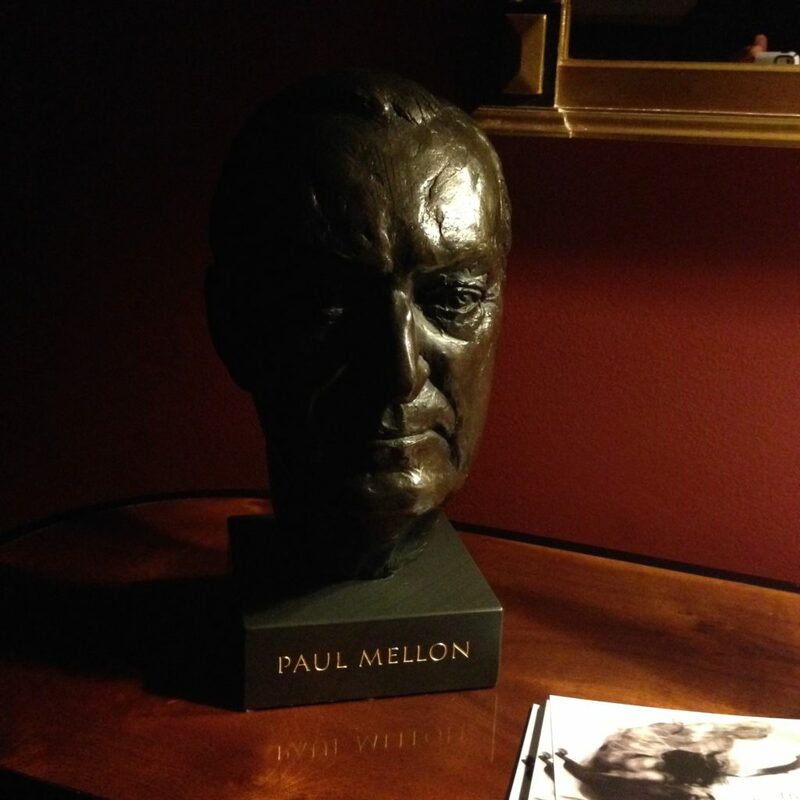 How can I not have yet included Paul Mellon, benefactor of the Center for Hellenic Studies? 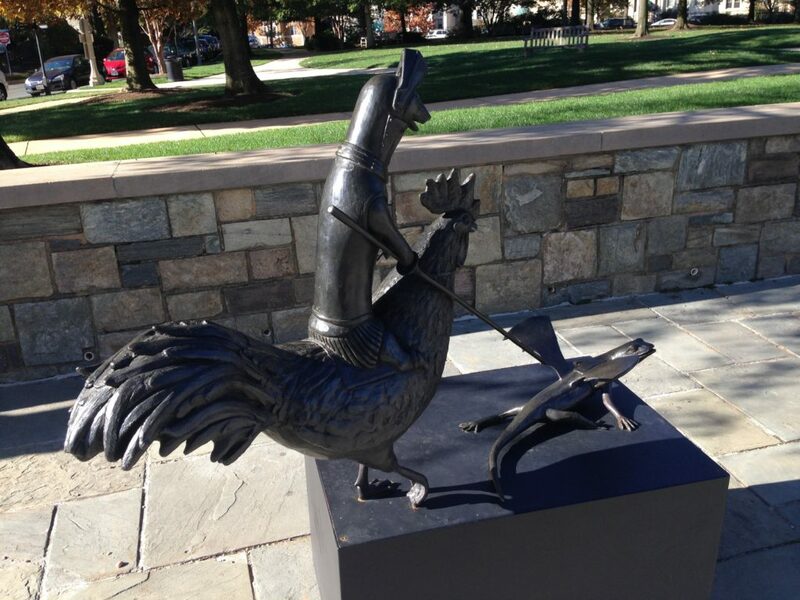 • And outside Washington National Cathedral, a sculpture by Bjørn Okholm Skaarup, part of a series called “Carnival of the Animals.” An otter, riding a rooster, spears a winged salamander. 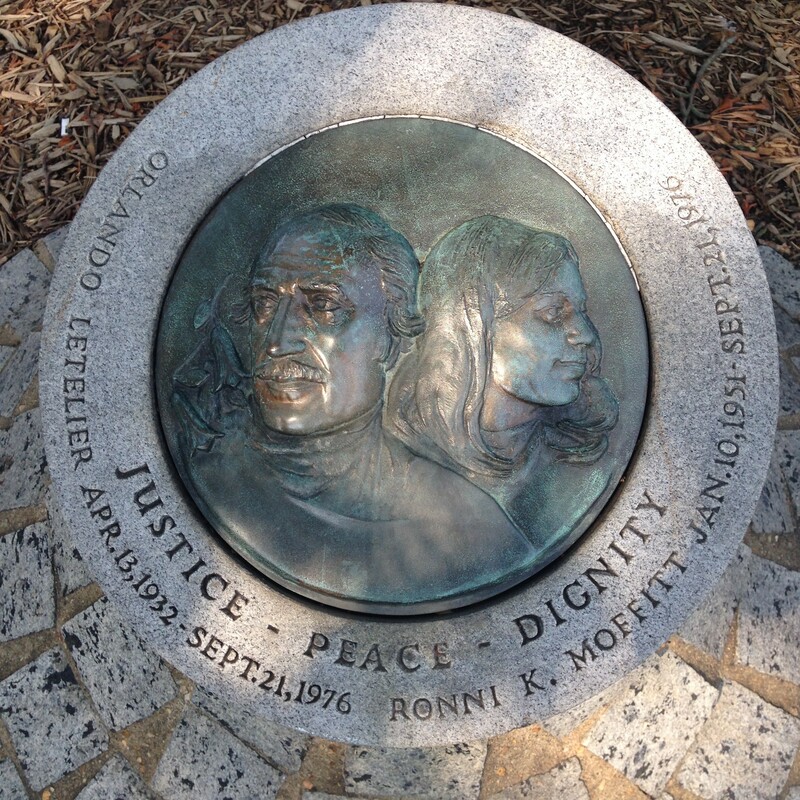 • Letelier and Moffitt were assassinated by a car bomb in DC in 1976 by DINA, the Chilean secret police under dictator Augusto Pinochet. Orlando Letelier had been a cabinet minister under Salvador Allende and was an outspoken opponent of Pinochet, which earned him the attention of DINA. Documents reveal that Pinochet ordered the assassination himself; whether the US knew and didn’t do anything to stop it is another question, but one fully within the realm of possibility. 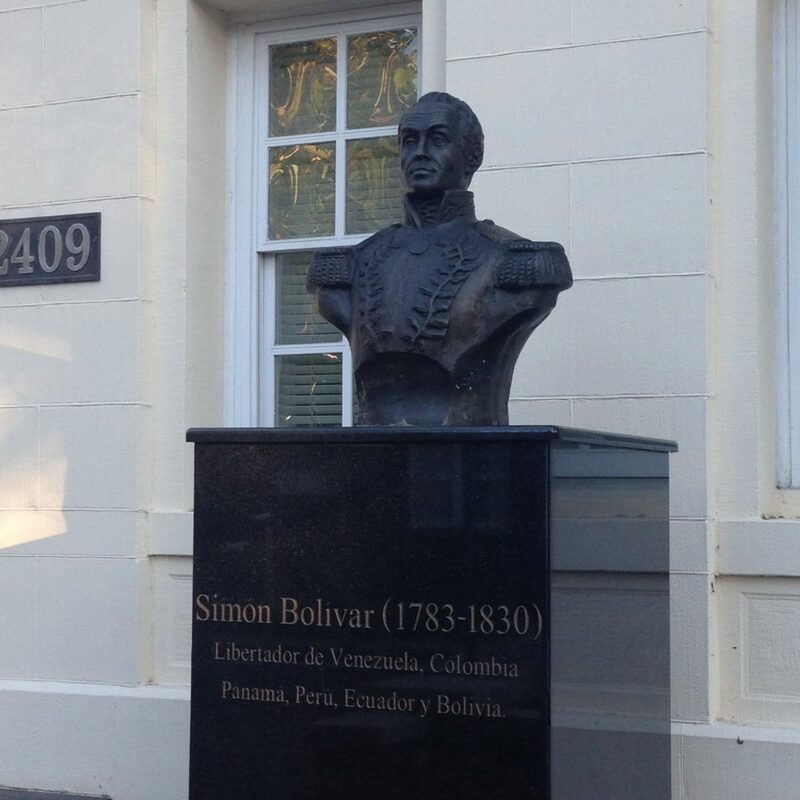 I do believe that this event helped turn American public opinion against Pinochet. 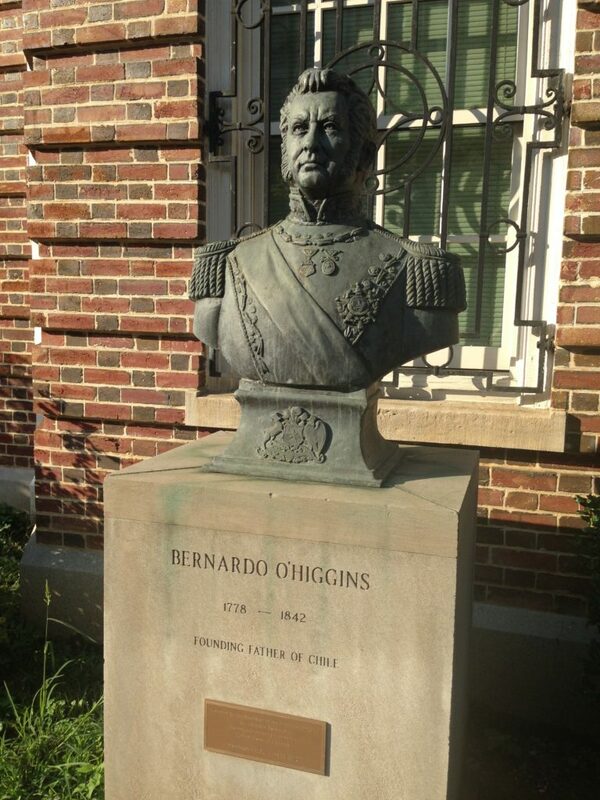 • Another figure from Chilean history: founder and first supreme dictator of Chile, Bernardo O’Higgins (1778-1842). 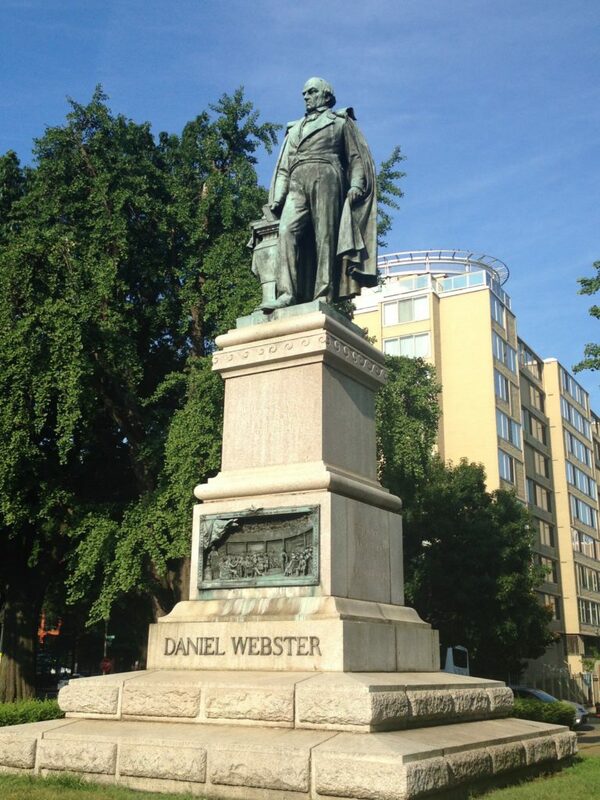 • The poet Henry Wadsworth Longfellow (1807-82) merits a statue at M St. and Connecticut Ave.
• Daniel Webster (1782-1852), Dartmouth alumnus (and valiant defender of the “small college”) and secretary of state under three presidents, stands on Massachusetts Ave.
• Dewi Saraswati, the Hindu goddess of knowledge, rides outside the Indonesian embassy, while three children benefit from her patronage. 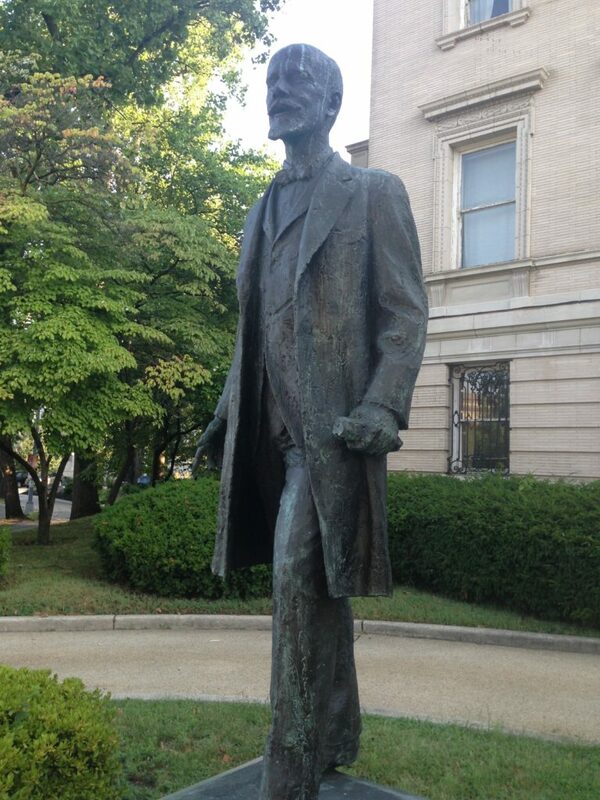 • Eleftherios Venizelos (1864-1936), several times Prime Minister of Greece in the early twentieth century, stands outside the Greek Embassy. 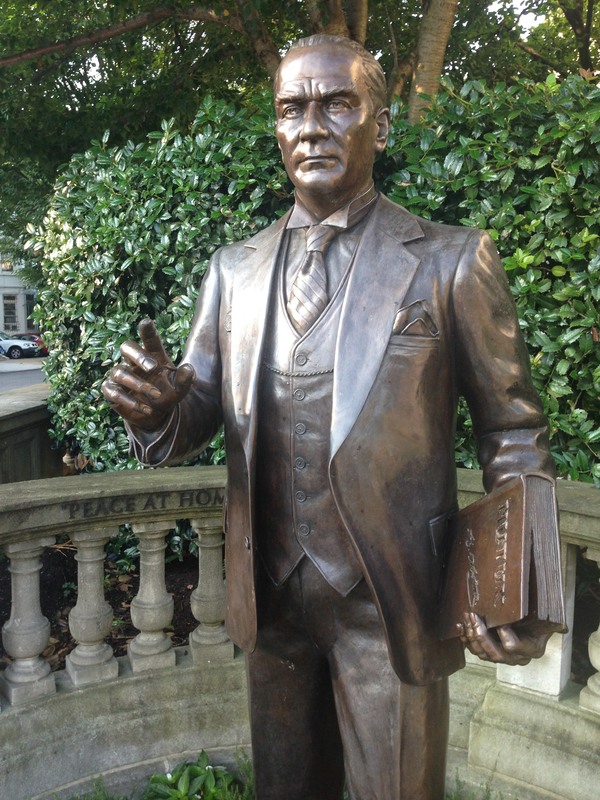 • Mustafa Kemal Atatürk, founder of modern Turkey, stands on the original site of the Turkish Embassy. 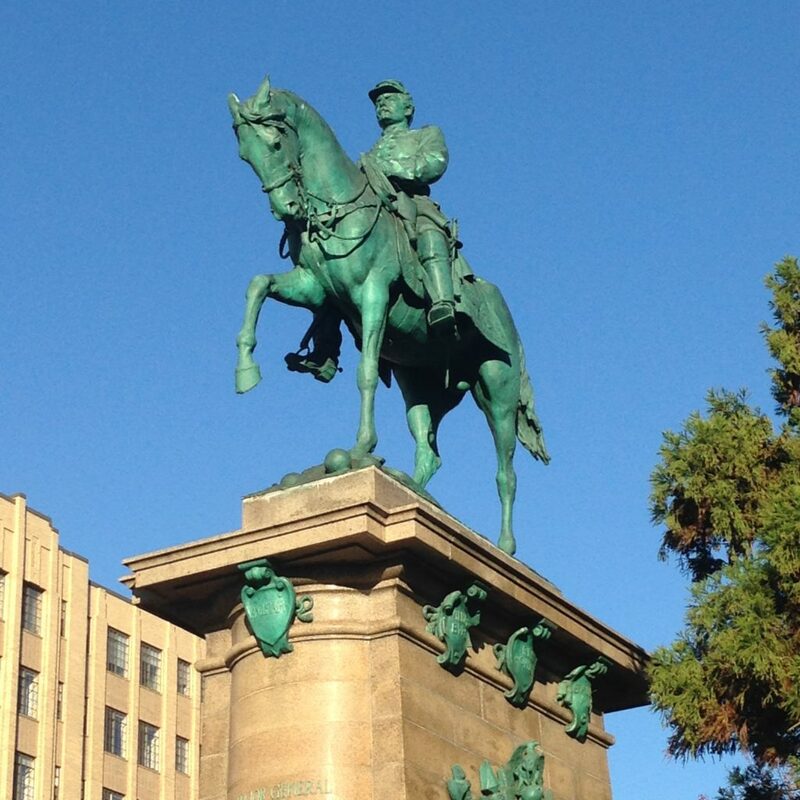 • Outside the South Korean embassy stands a statue of Philip Jaisohn (1864-1951), journalist and champion of Korean independence. 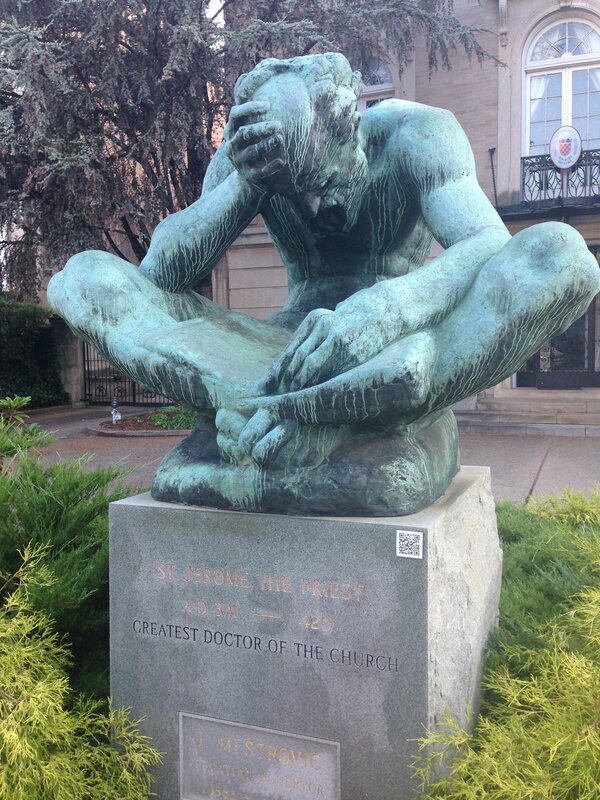 • A statue of St. Jerome, one of the patron saints of Croatia, may be seen outside the Croatian embassy. 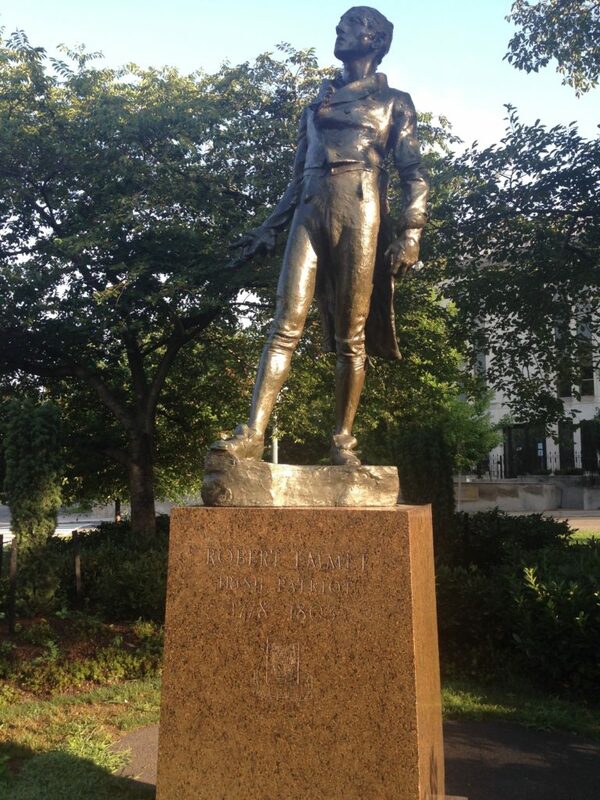 • Irish patriot Robert Emmet (d. 1803) gives his famous speech from the dock. 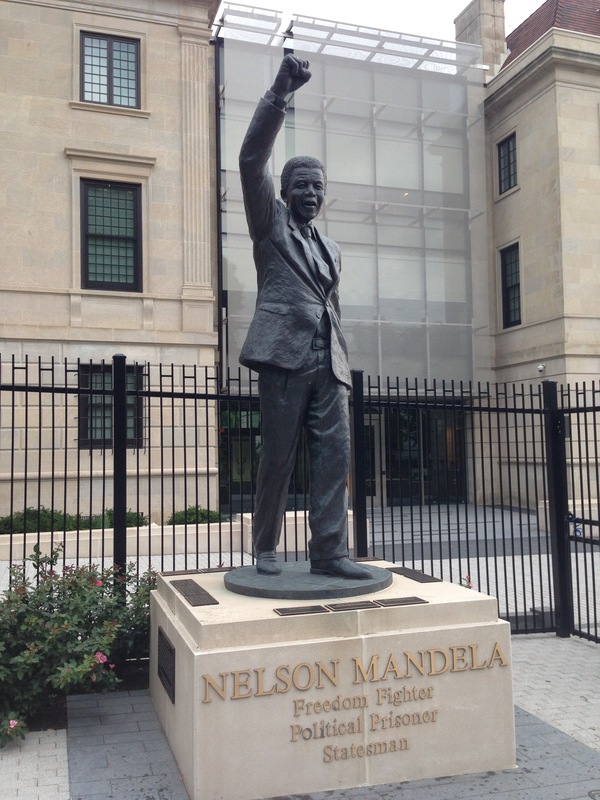 • The late great Nelson Mandela stands outside the South African embassy. 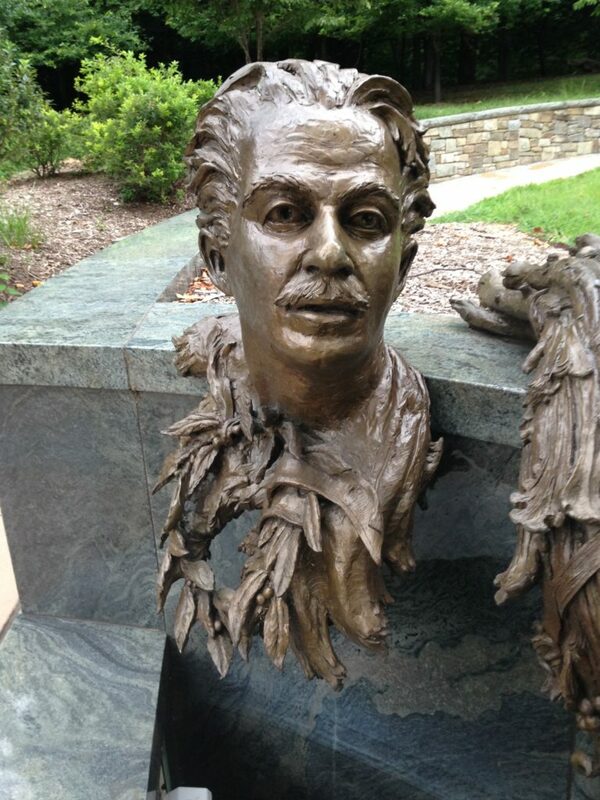 • The Kahlil Gibran Centennial Foundation sponsored a sculpture of their favorite poet in 1991. 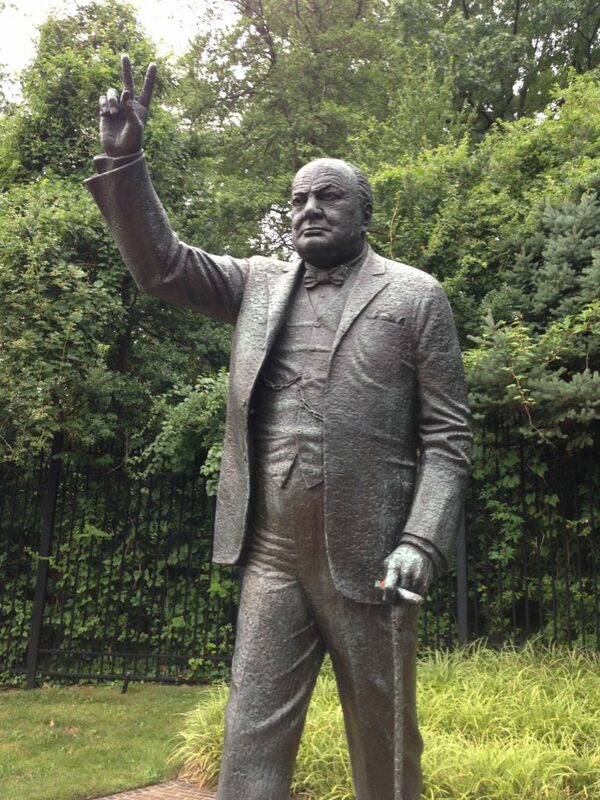 • Winston Churchill strides outside the British Embassy. 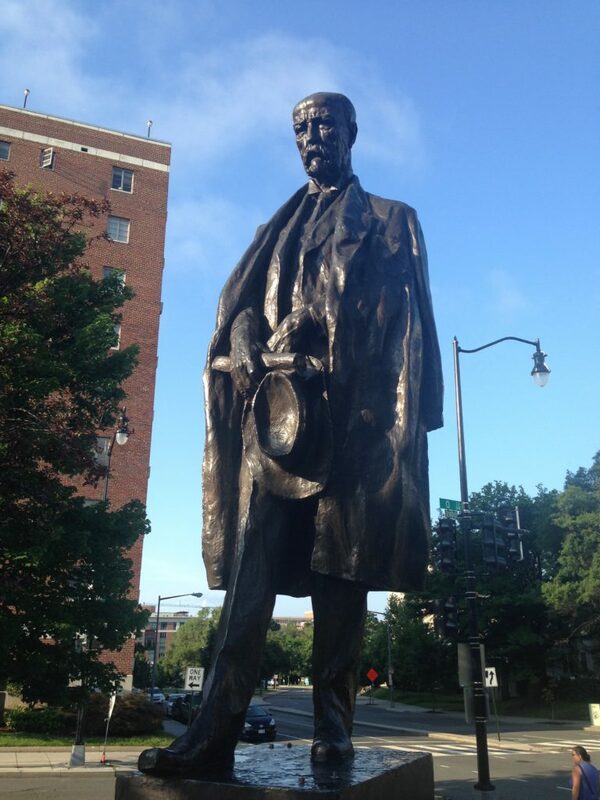 If I had a cigar I would have stuck it between his fingers. 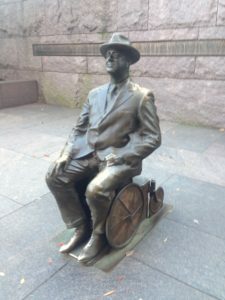 One of his feet stands on embassy soil, the other on American soil, symbolizing the Special Relationship and Churchill’s own dual nature. 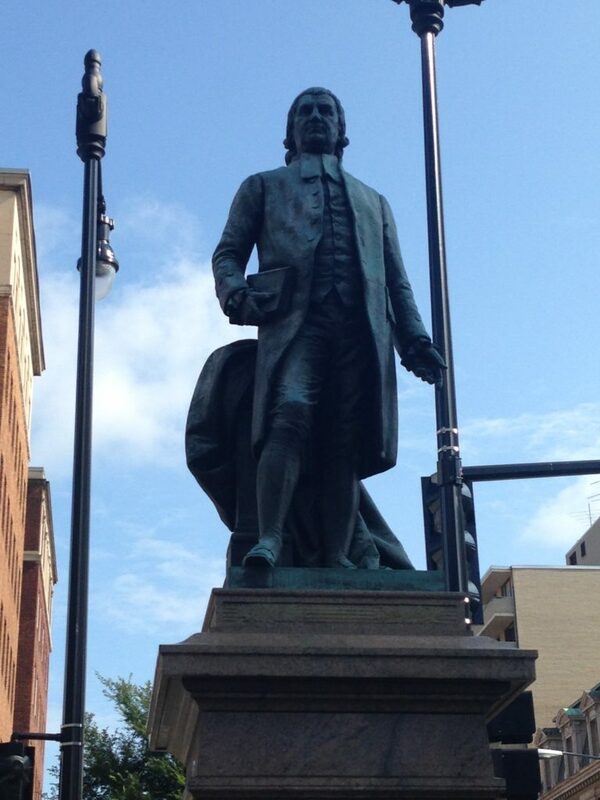 • Dr. John Witherspoon (1723-94), a signatory to the Declaration of Independence, stands by the national Presbyterian church. • Outside the Treasury Department stands Albert Gallatin (1761-1849), the longest-serving Secretary of the Treasury. 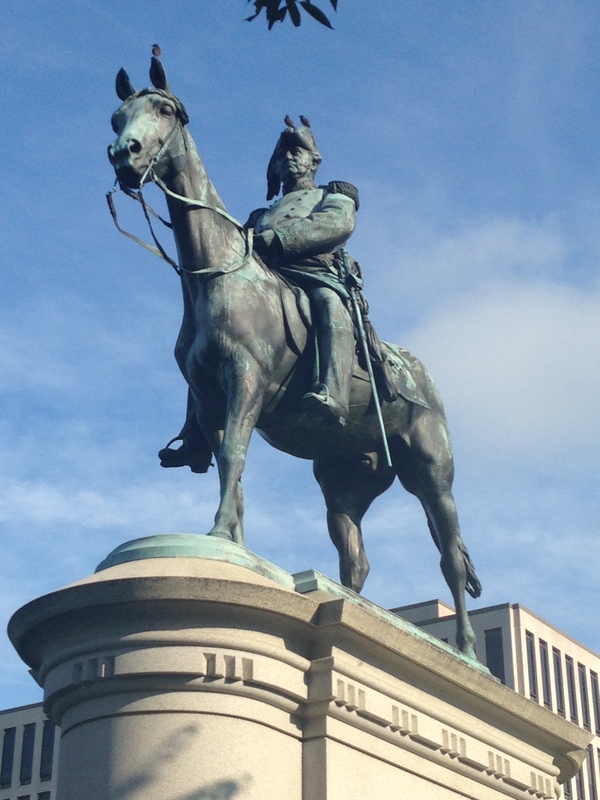 • General Winfield Scott (1786-1866), veteran of several nineteenth-century US wars, Whig Party presidential candidate in the election of 1852, and originator of the Anaconda Plan during the Civil War, rides in Scott Circle, with some avian friends. 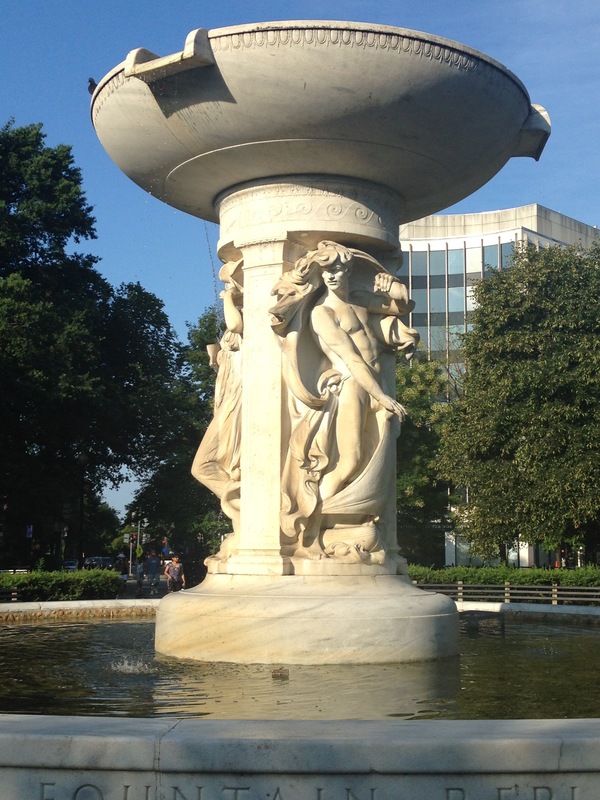 • The Rear Admiral Samuel Francis Dupont Memorial Fountain can be found on Dupont Circle. 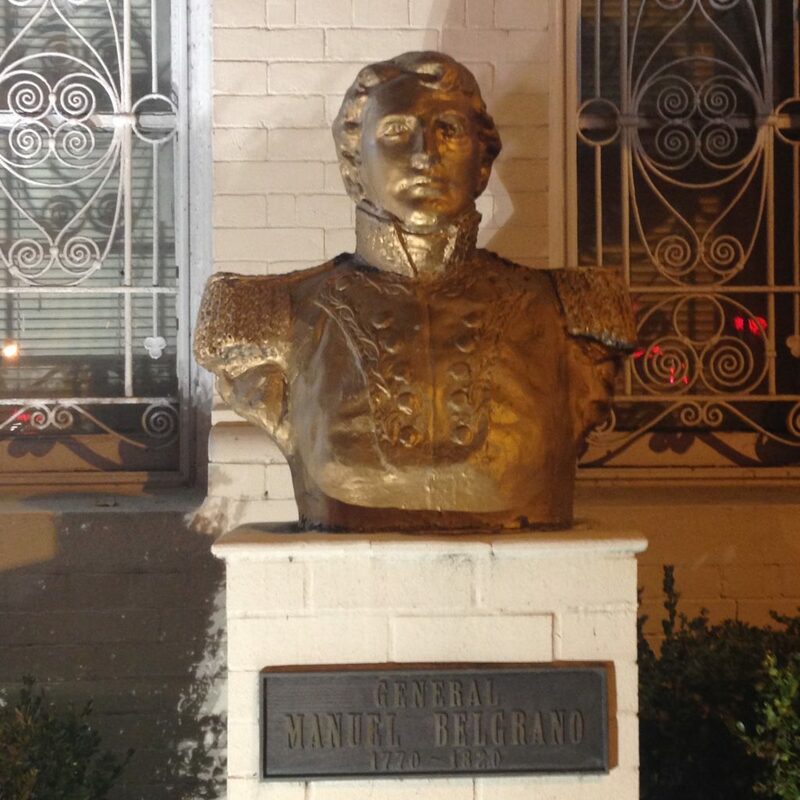 Dupont (1803-1865) captured San Diego during the Mexican-American War, but did not manage to capture Charleston during the American Civil War, to his chagrin. 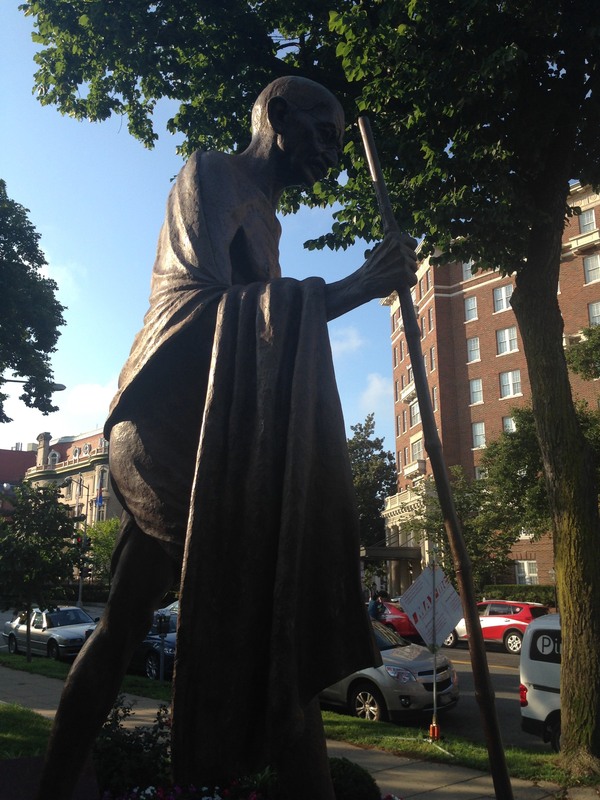 • The Indian Council for Cultural Relations installed a statue of the great Mahatma Gandhi (1869-1948) in front of the Indian Embassy in 2000. 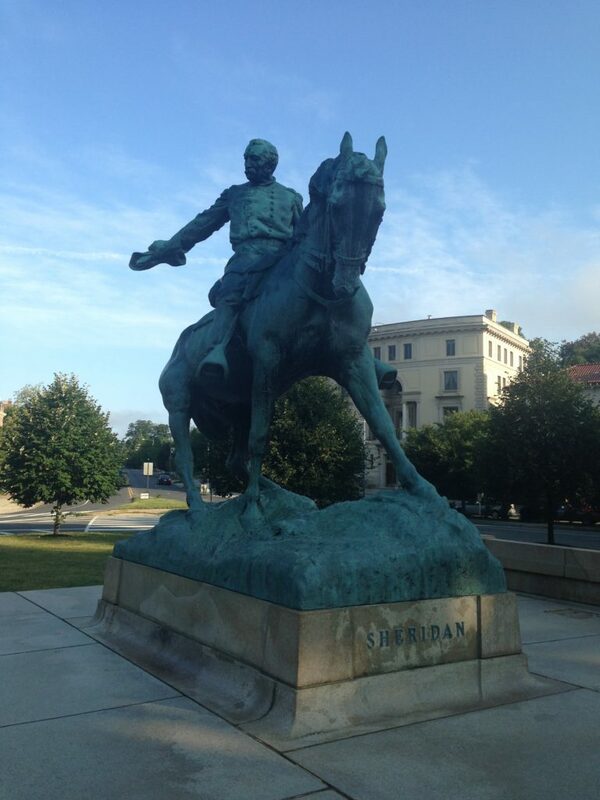 • An equestrian statue of Maj. Gen. Philip Sheridan (1831-1888) can be found in the middle of Sheridan Circle. 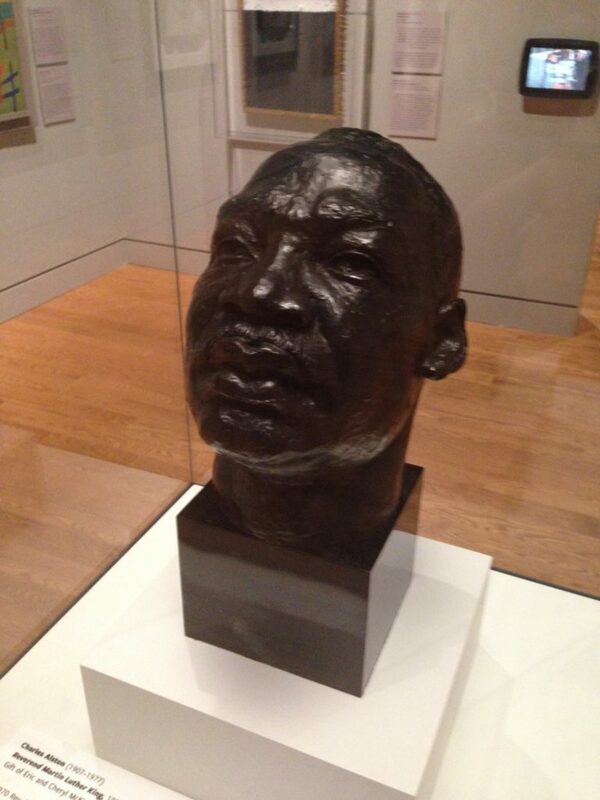 This one was done by Gutzon Borglum, the same guy who did Mount Rushmore. Sheridan was a distinguished Civil War general and helped force Lee’s surrender at Appomattox. 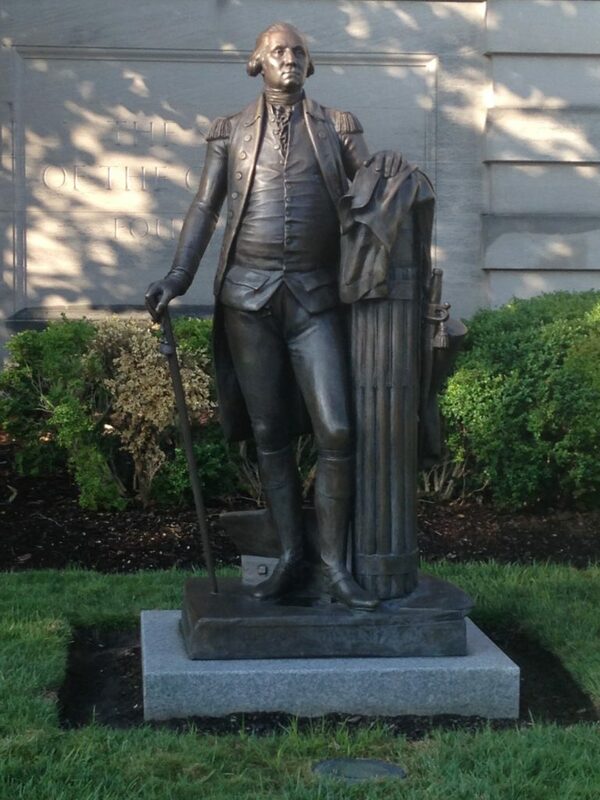 • Finally, outside the headquarters of Society of the Cincinnati, a statue of the American Cincinnatus himself, George Washington. 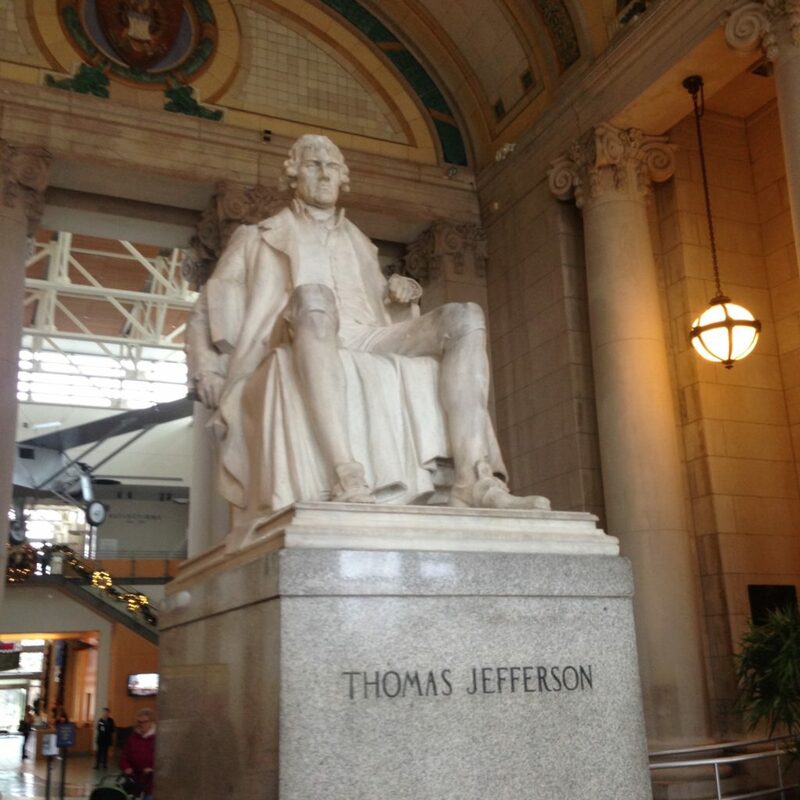 Thomas Jefferson, third president and Louisiana Purchaser, at the Missouri Historical Society. 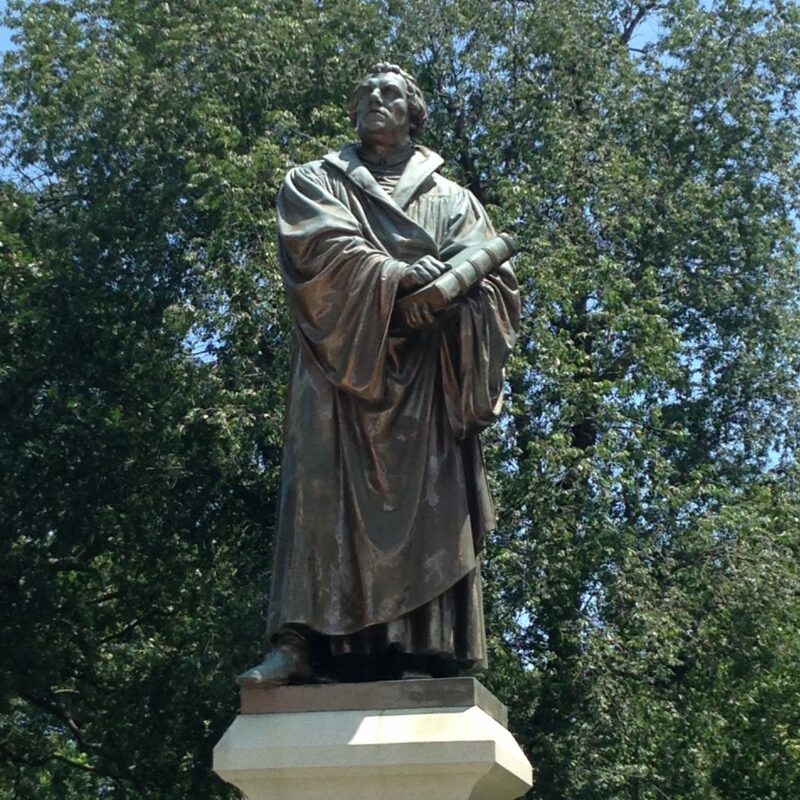 The late great Martin Luther stands guard at Concordia Seminary St. Louis. 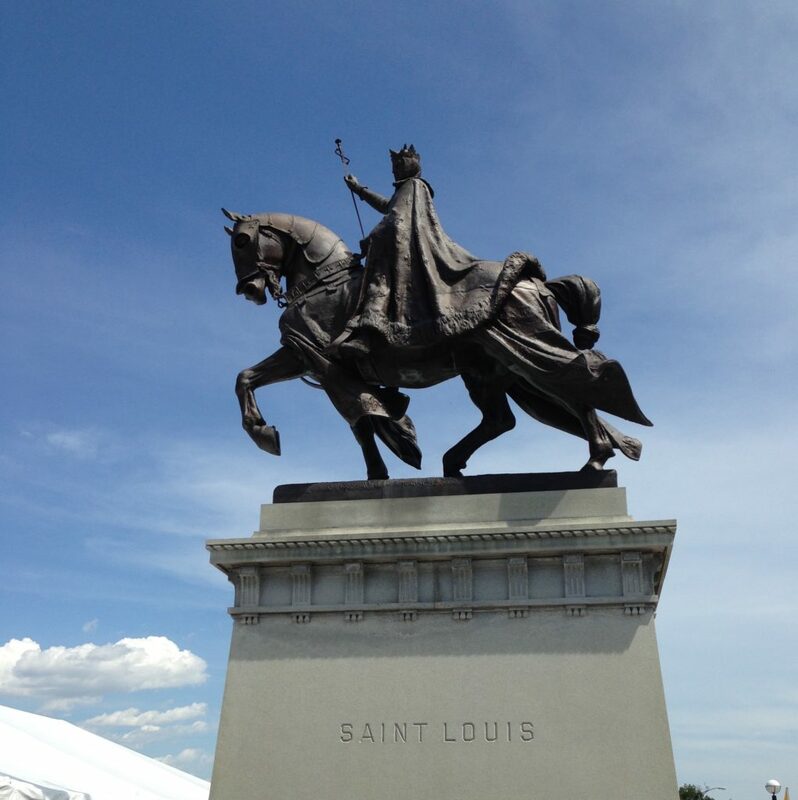 St. Louis himself rides outside the St. Louis Art Museum. 1. 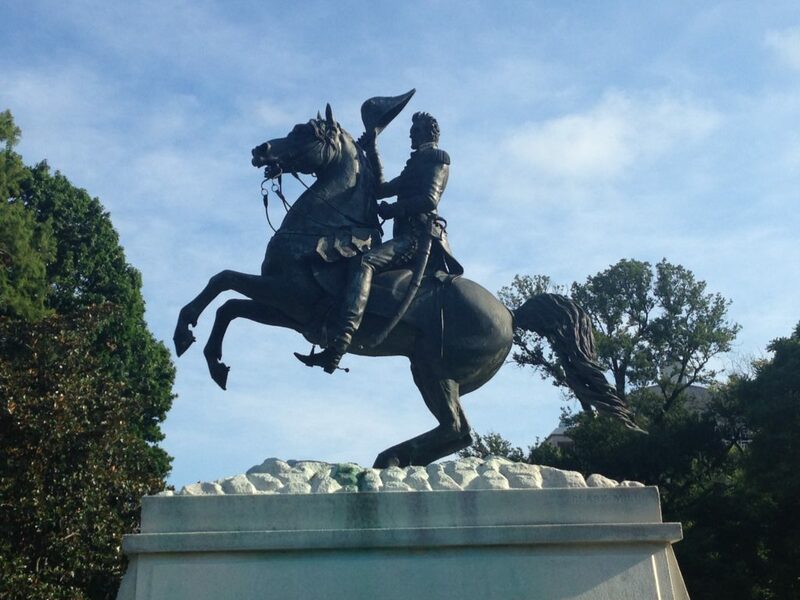 Baton Rouge, Louisiana. 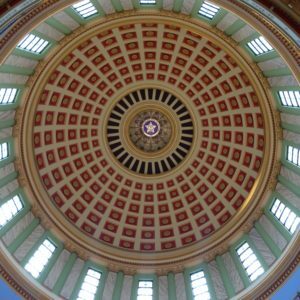 This departs from the regular pattern of a neoclassical dome – instead, like Bismarck, N.D. or Lincoln, Nebr., it takes the form of a tower. 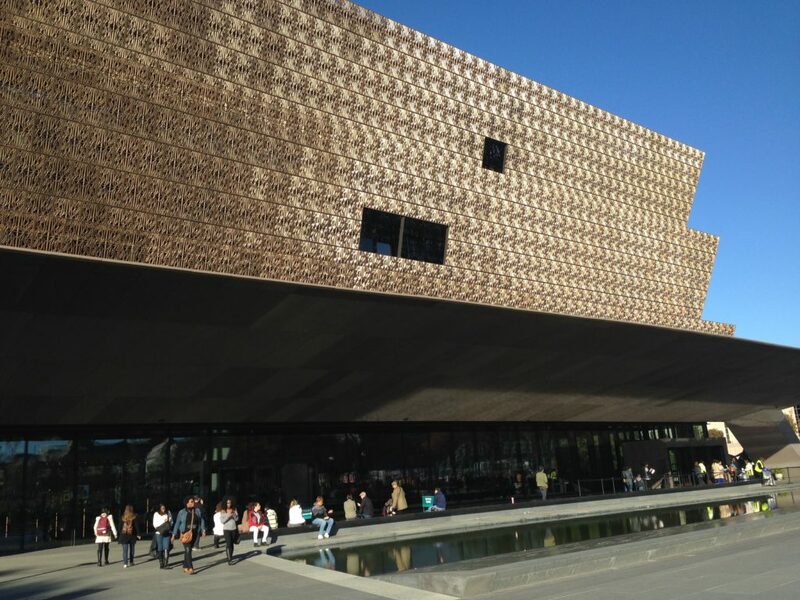 You can take the elevator to the top for a nice view. 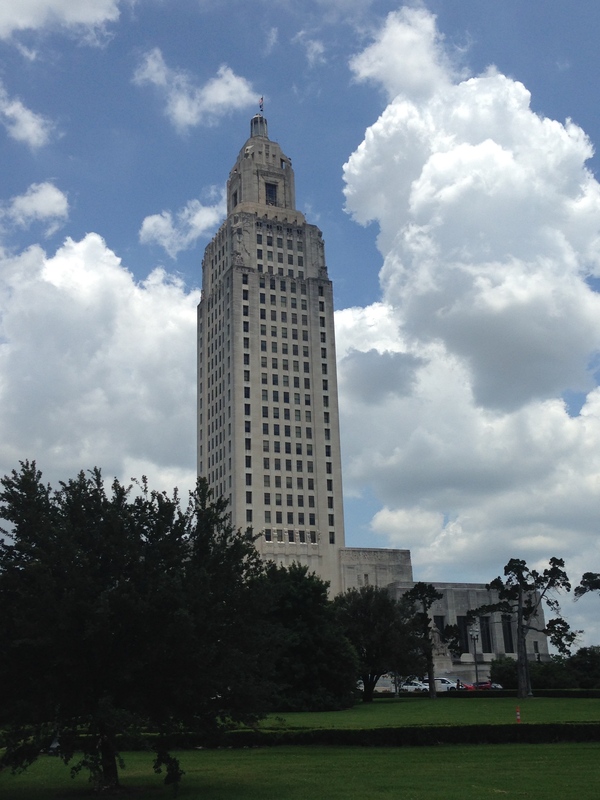 This building, of course, is essentially a monument to Huey Long, Louisiana’s populist Depression-era governor, who authorized its construction and who was assassinated in it in 1935. 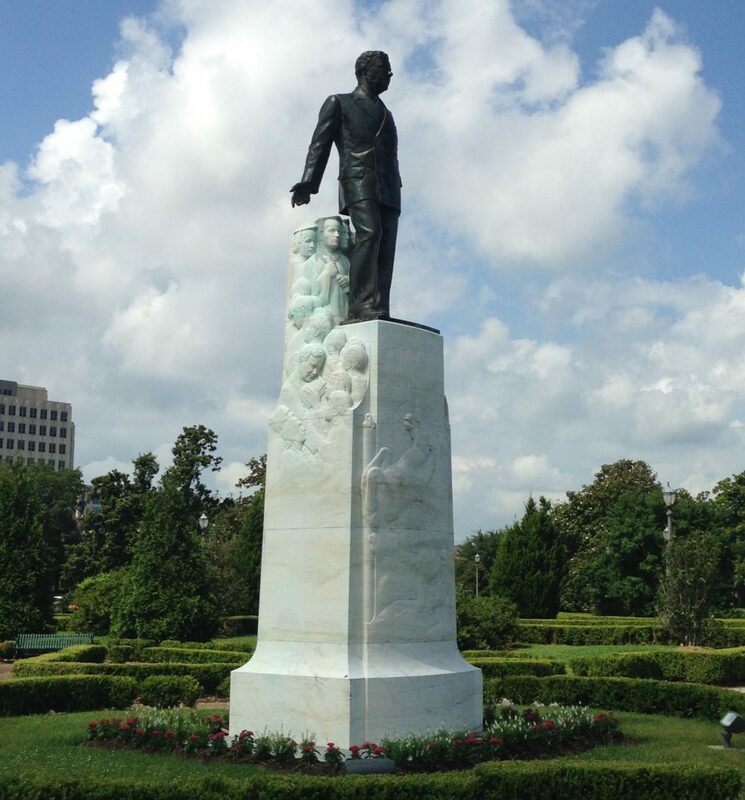 A statue of the Kingfish stands on the grounds. 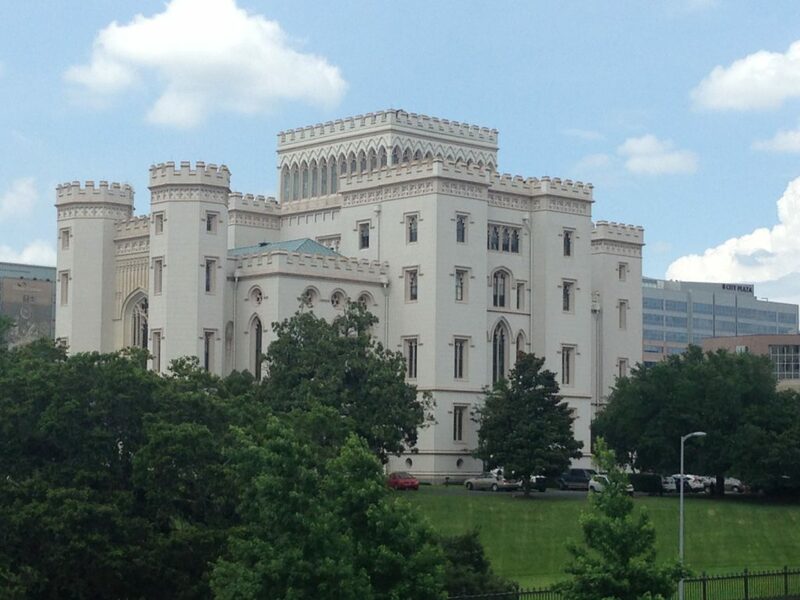 The former capitol building down the street is a crenellated structure that now acts as a museum of political history. 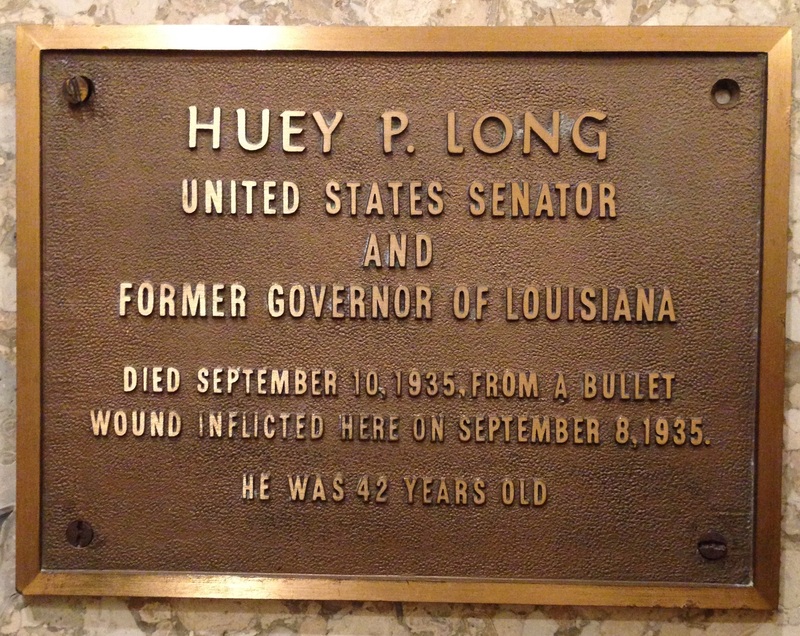 Needless to say, Huey Long appears in here, too. 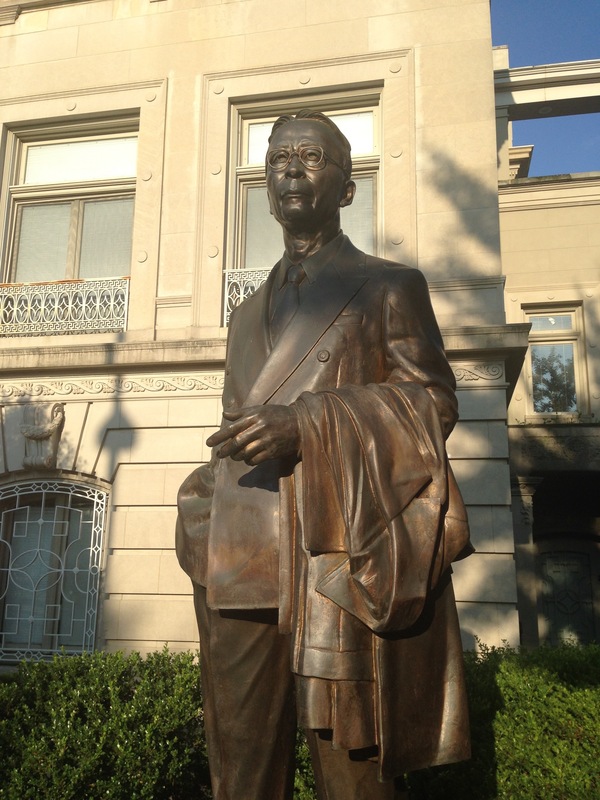 The Capitol Park Museum nearby is first rate. 2. 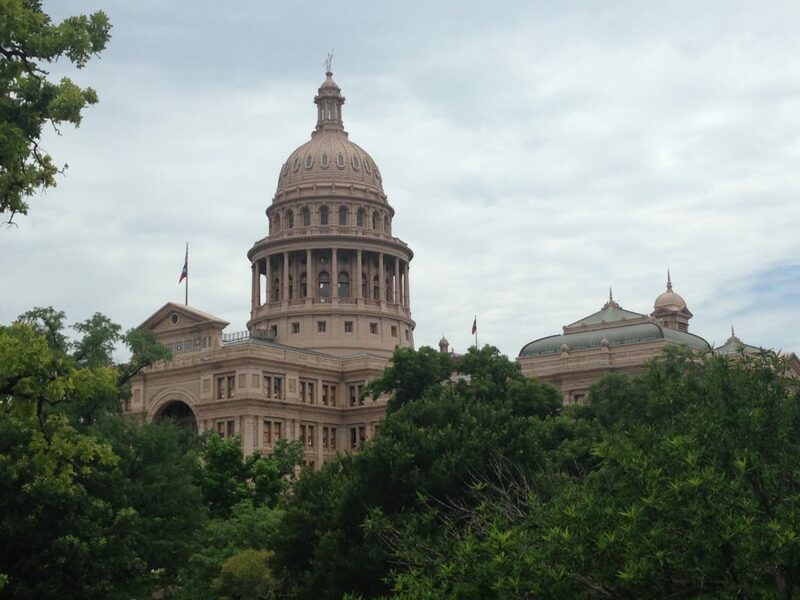 Austin, Texas. Quite large, as befits anything Texan. 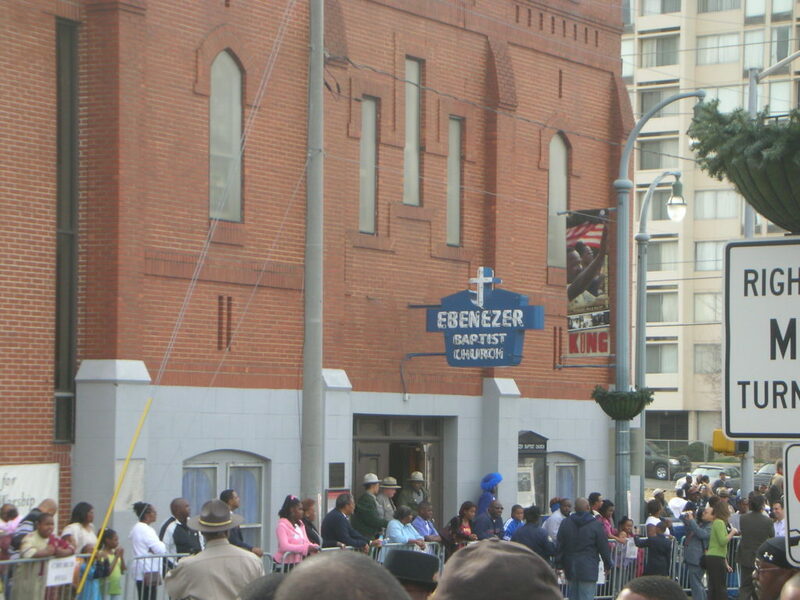 It was surprisingly crowded on a Sunday. 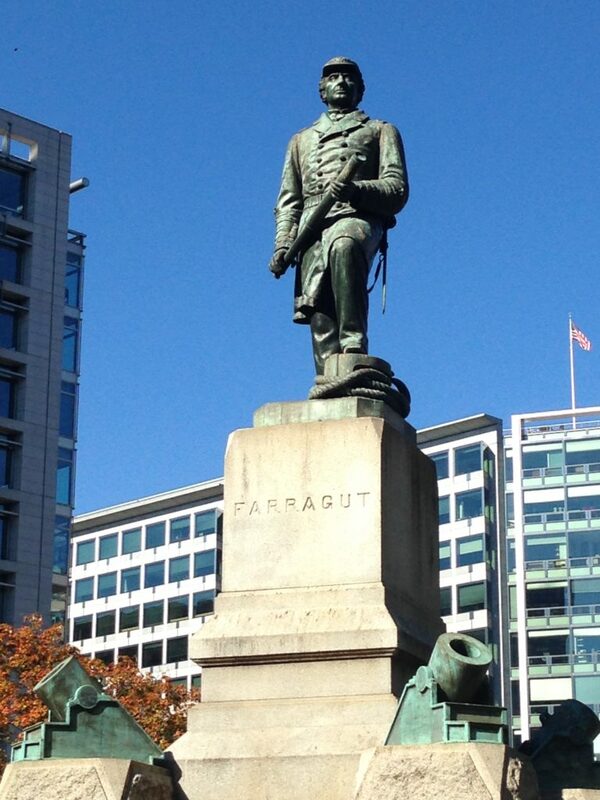 I was amused to note that the guards were armed with assault rifles. Don’t mess with Texas! 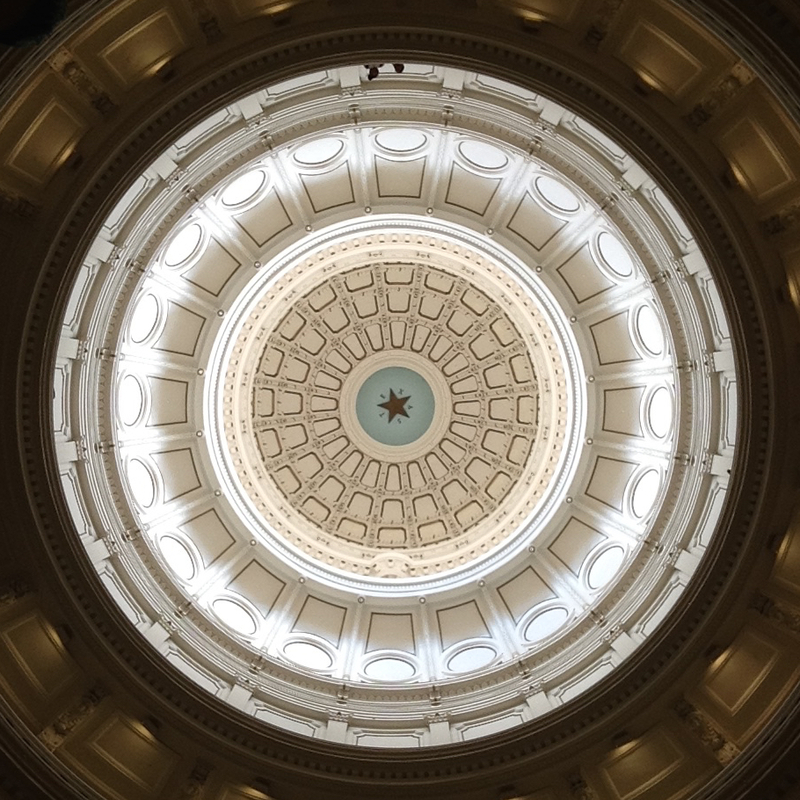 Enjoyed the portraits of Ann Richards, George W. Bush, and Rick Perry, along with the view of the interior of the dome, and the mosaic on the floor. You can hardly see it, but “TEXAS” appears between the arms of the star. 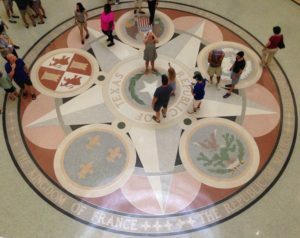 Another appearance of the Six Flags, or rather, the Six Emblems, with Texas at the center of the large star, and the other five between the arms of the star. 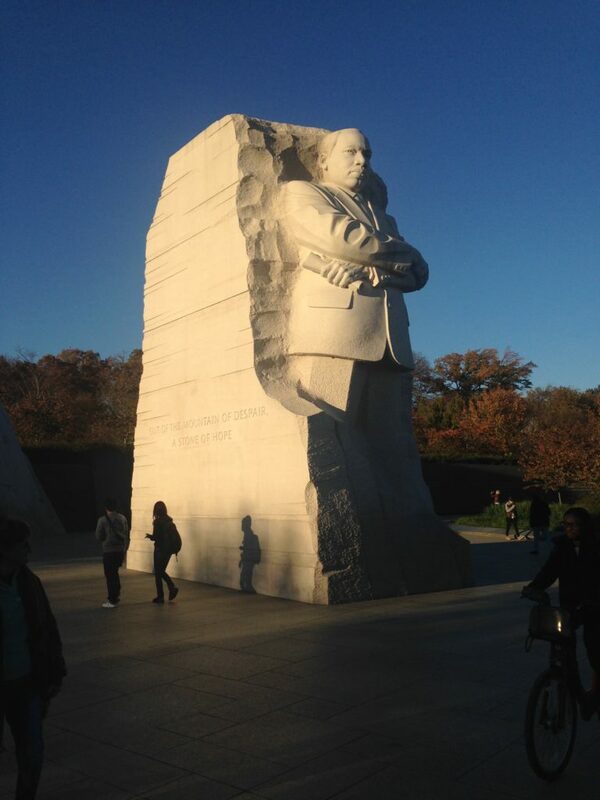 Alas, this was the least crowded it ever got while I was there. 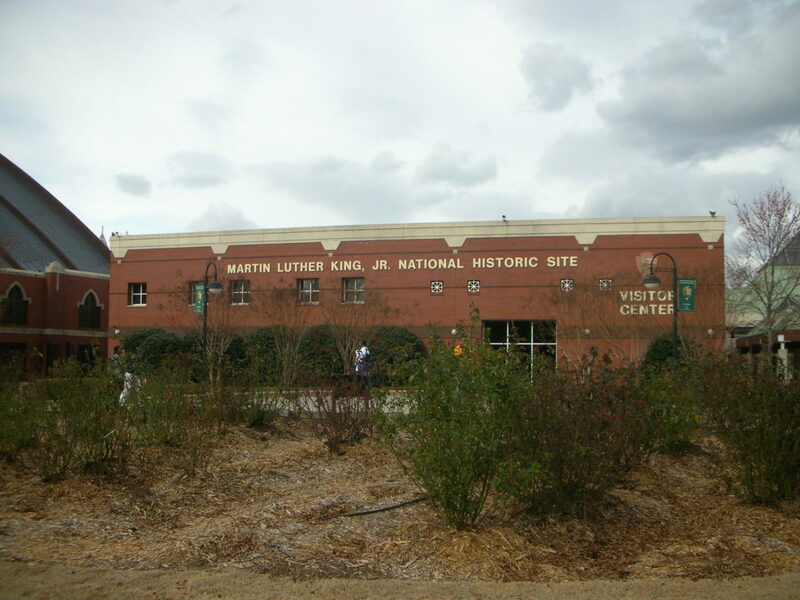 Down the street, the Bullock Texas State History Museum is wonderful. 3. 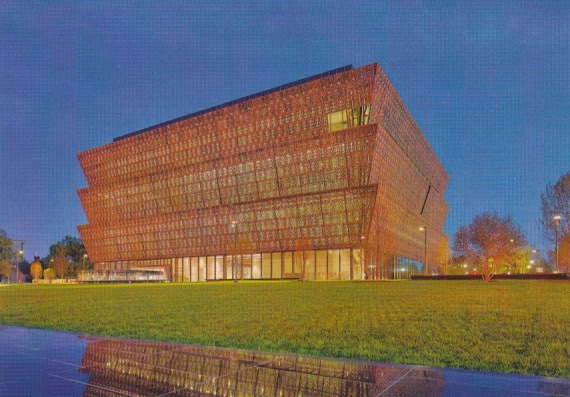 Oklahoma City, Oklahoma. A rainy day and construction, but the locals were certainly friendly. 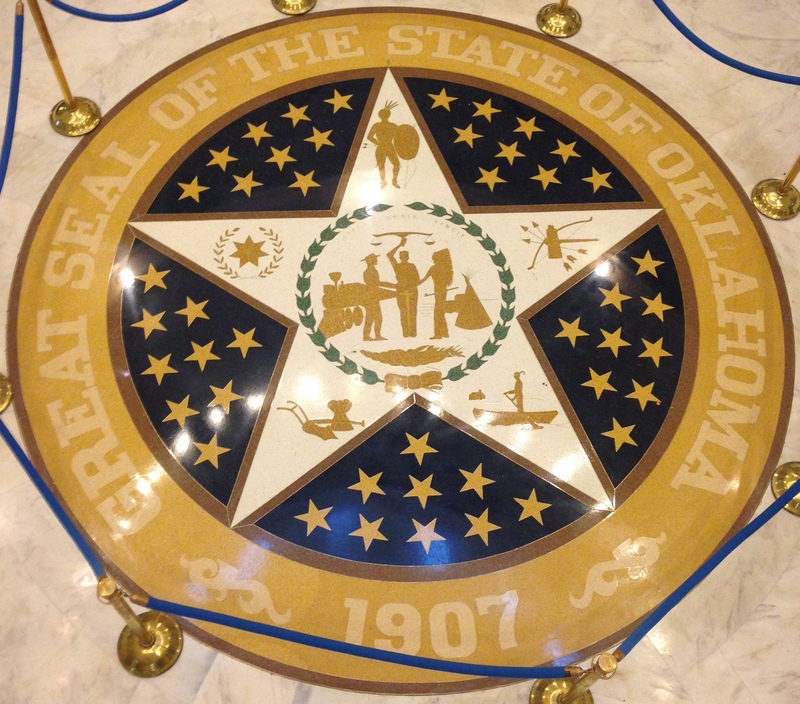 The interior has a nice collection of paintings of famous Oklahomans, like Will Rogers, Gene Autry, Sequoyah (they claim him), and Wiley Post. 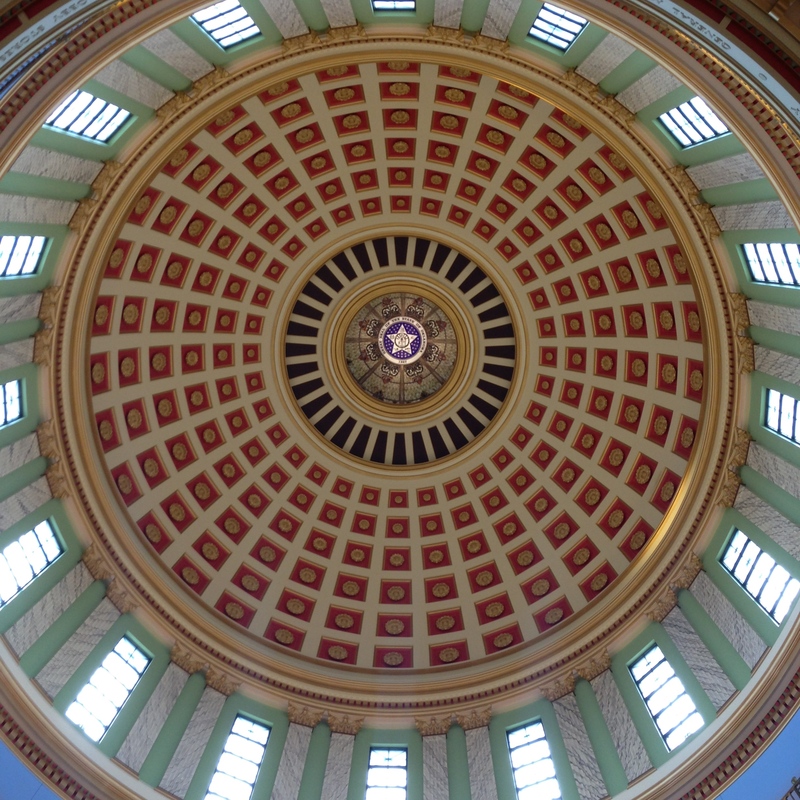 Like Texas, the interior of the dome is nice, as is the floor decoration beneath it. The arms of the star illustrate devices used by the Five Civilized Tribes, who were all expelled there in the nineteenth century: starting with the seven-pointed star on the top left and moving clockwise, these are the Cherokee, Chickasaw, Choctaw, Seminole, and Creek. The middle of the seal shows “Columbia” (a feminine personification of America not much used anymore), holding a balance above her head, and blessing a handshake between a white settler and an American Indian, who are flanked respectively by a train and a teepee. 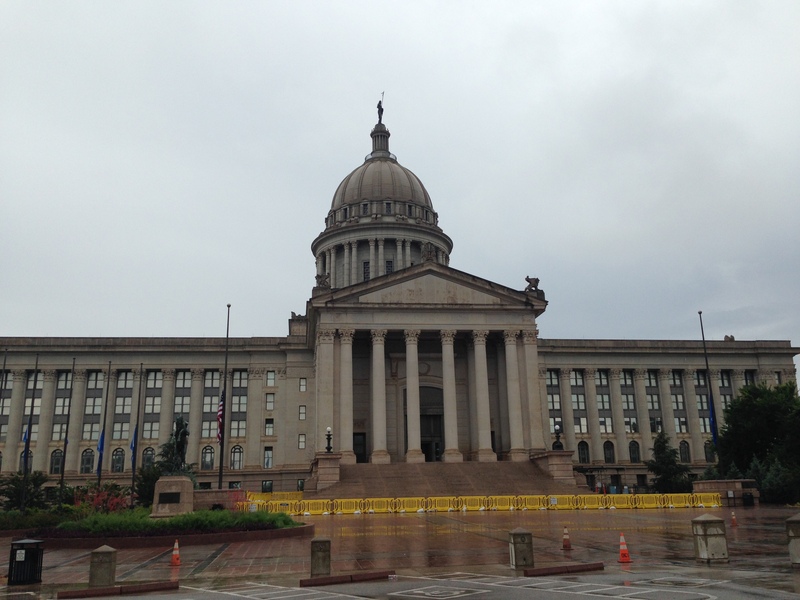 Unfortunately, we were too late to see the Oklahoma History Center. Next time!